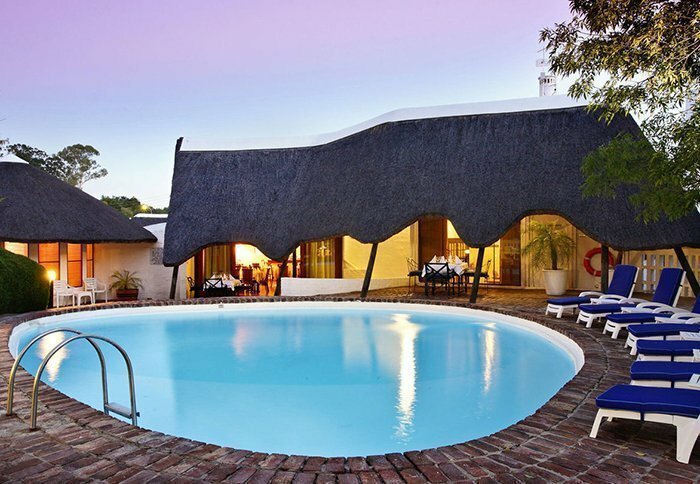 For more information about the accommodation we make available on our South Africa holidays see here. 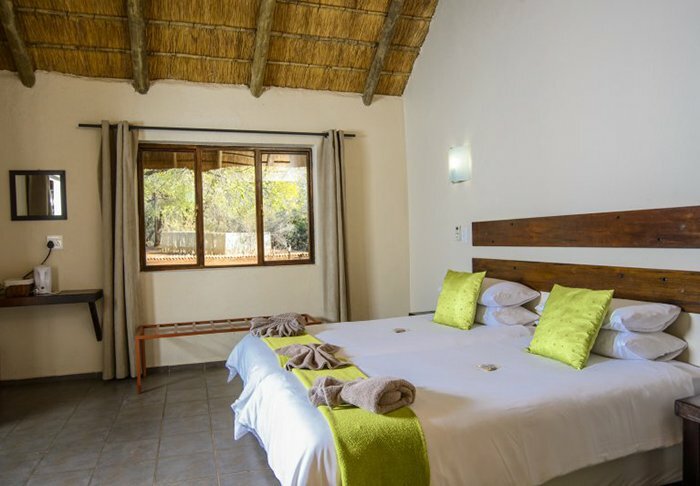 You can also view pictures of the accommodation here. 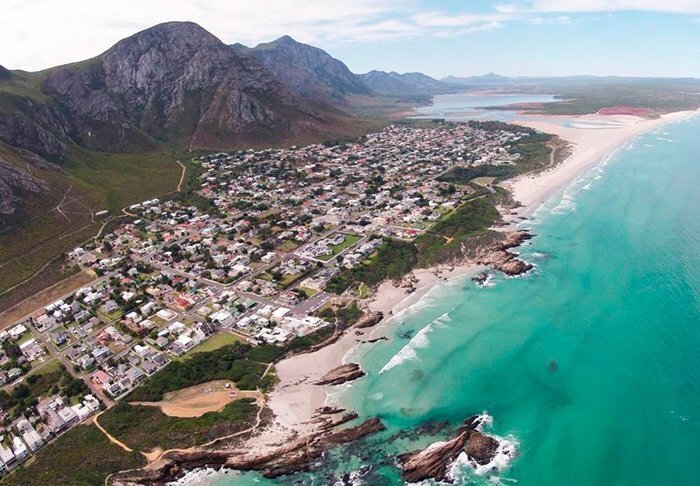 Roll your mouse over the small images to see the larger version. 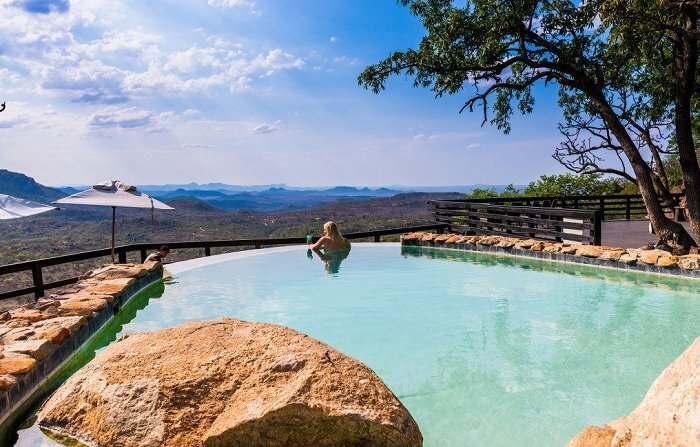 Bongani Mountain Lodge is beautifully located on the border with the southern part of the Kruger National Park and near the magnificent Malelane mountains. 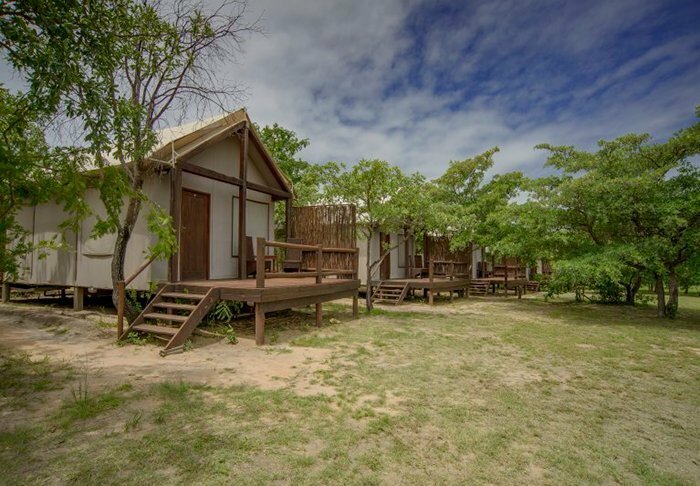 Accommodation is built in traditional style and consists of cabins with private verandas and with stunning views of the beautiful scenery. 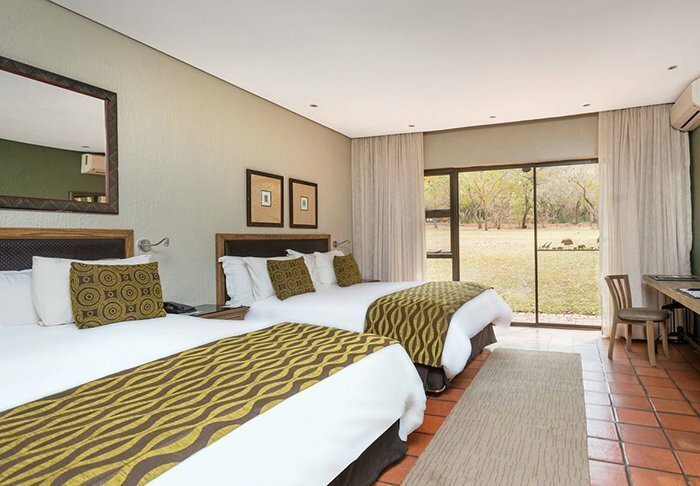 Rooms are equipped with ceiling fan, mosquito nets, safety box, minibar, hairdryer, telephone and a coffee maker. 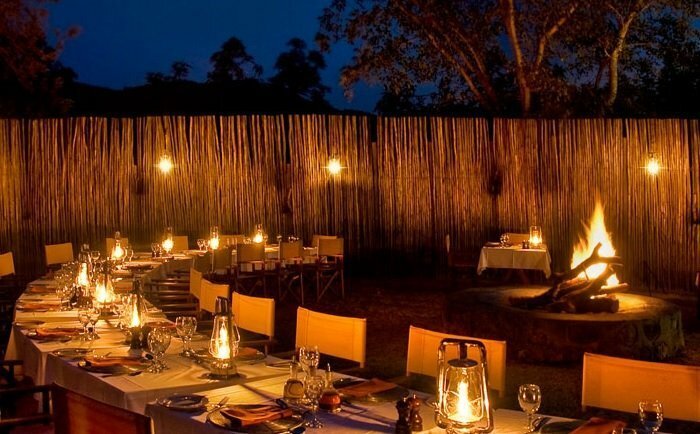 The lodge provides a restaurant where you can enjoy an exquisite Pan-African dinner in the cozy dining room or on the traditional boma, an outdoor dining area. 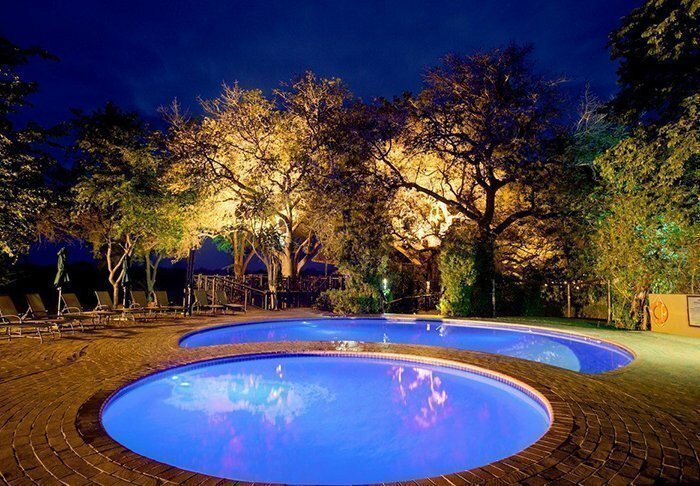 Additionally, after a long day of exploring, you may wish to relax at the lodges beautifully situated pool area. 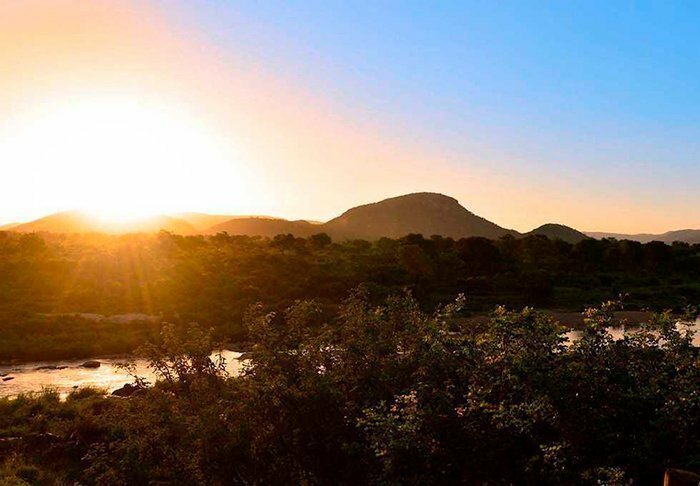 Nkambeni Safari Tented Camp is located in Kruger National Park, with a fantastic view out over the surrounding area. 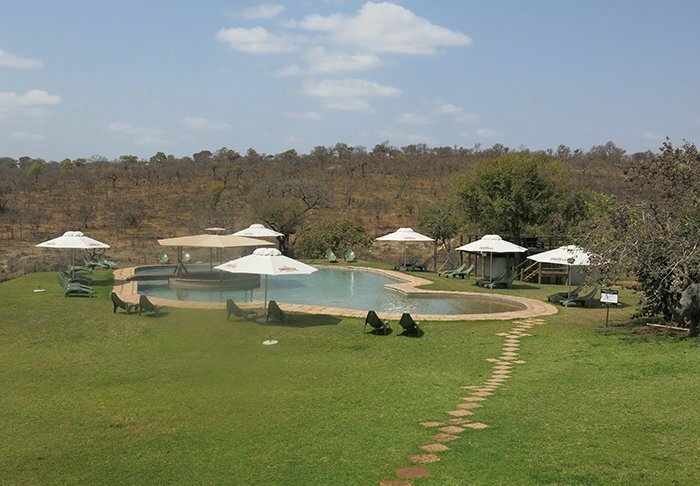 Nkambeni is a camp made up of luxury tents. 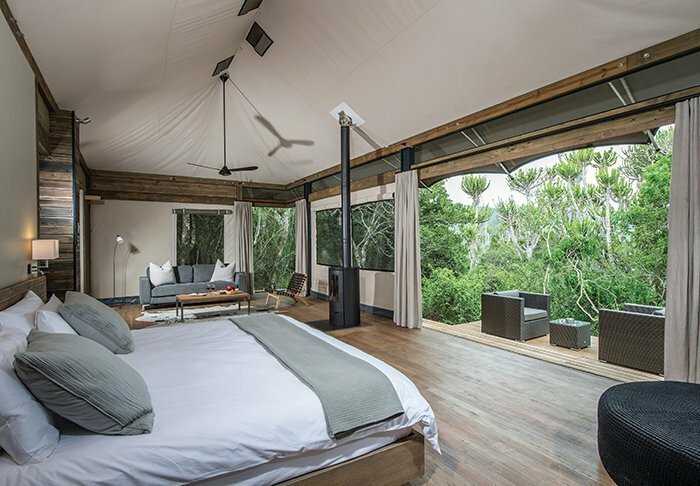 The tents are raised above ground level and feature modern conveniences such as wooden floors, air conditioning, and good toilet/bathroom facilities with both indoor and outdoor showers. 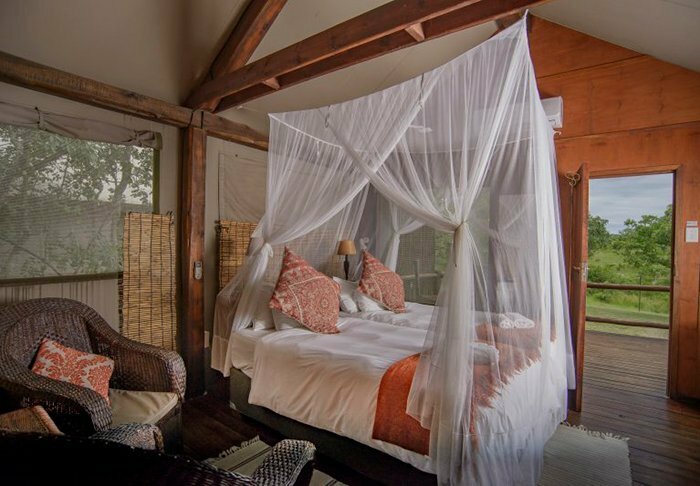 In addition, they are equipped with delightfully large beds surrounded by mosquito nets. 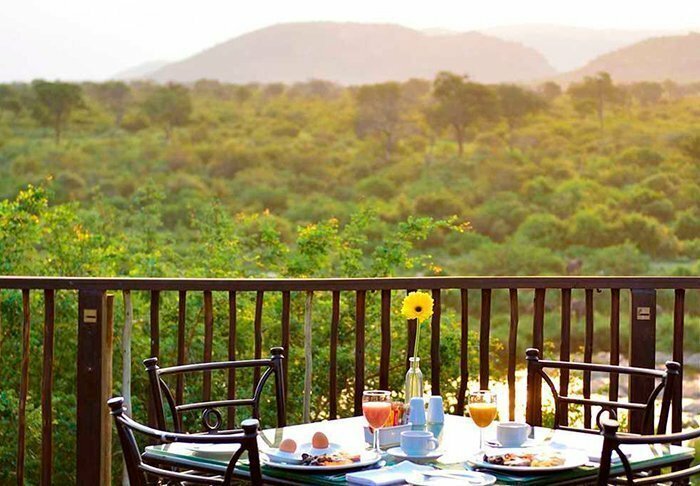 From the tent verandas, there are wonderful views of the local landscape, and some even overlook Kruger National Park directly. 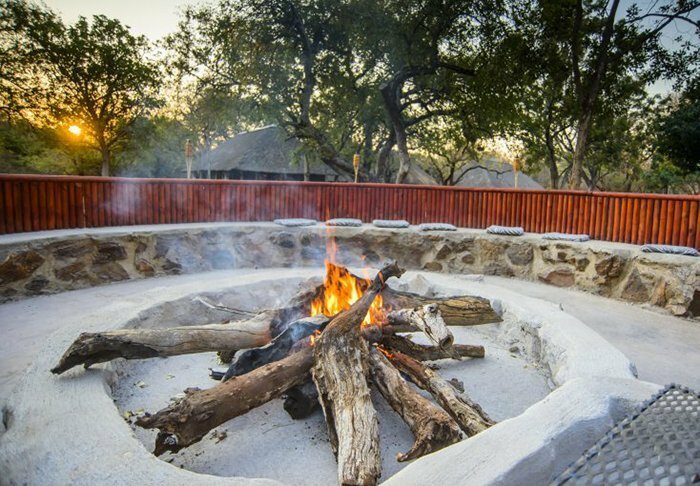 Camp facilities include an excellent restaurant, a bar and a swimming pool – which also offers a delightful view out over Kruger National Park. 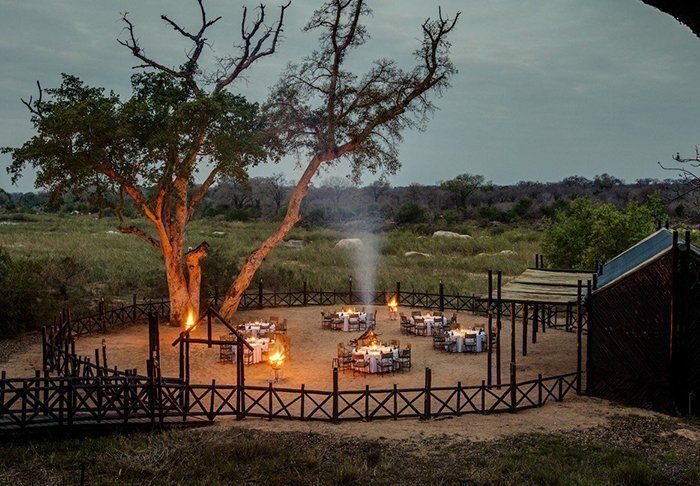 The camp also includes several ‘bomas’ – typical South African camp fire sites where food is served under the open sky. 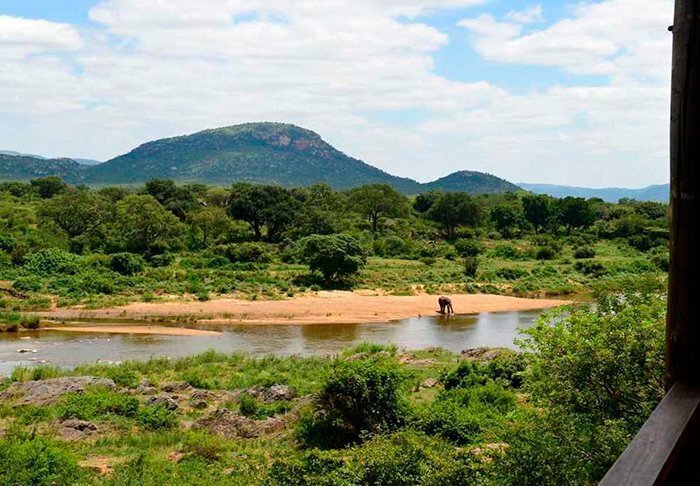 Nkambeni is rightly known for its remarkable atmosphere, and gives you the chance to enjoy the special experience of living close to the wild animals of the Savannah. 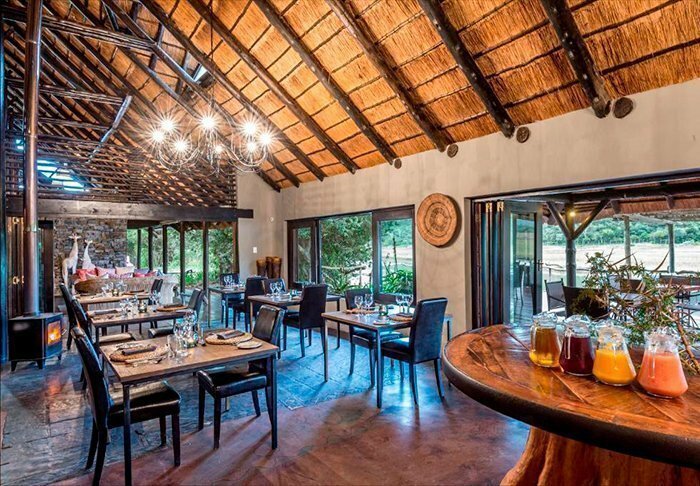 The beautiful lodge is located in a wonderful, quiet landscape surrounded by beautiful gardens and a large swimming pool – just a stone’s throw from the Kruger National Park. 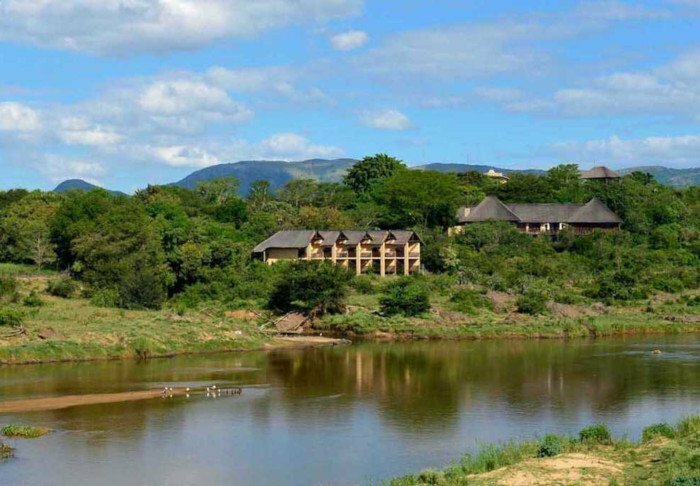 With a panoramic view of the savannah and the Crocodile River, you immediately feel in harmony with the nature and the wildlife. 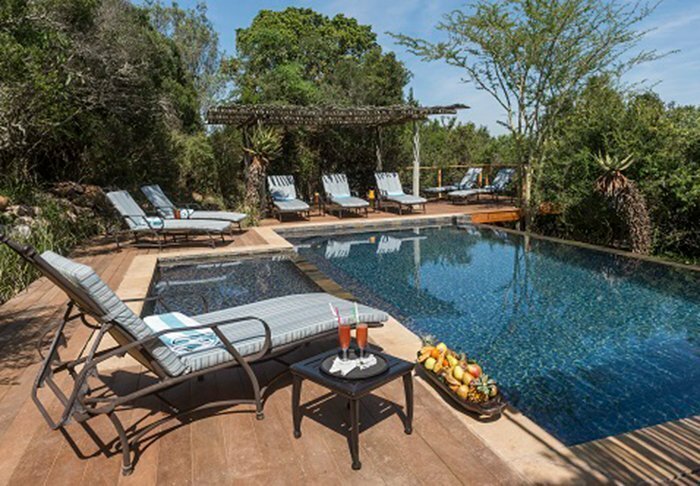 Furthermore, the 4-star lodge offers several options for relaxation and wellness including spa cures, massage, swimming and an amazing view. 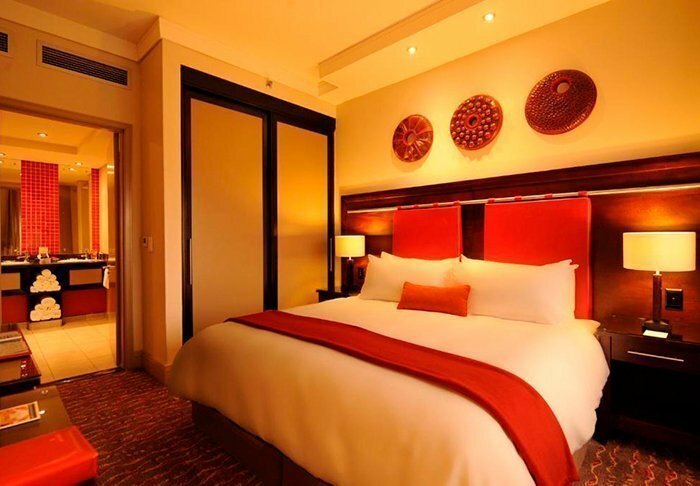 Limited number of deluxe rooms. 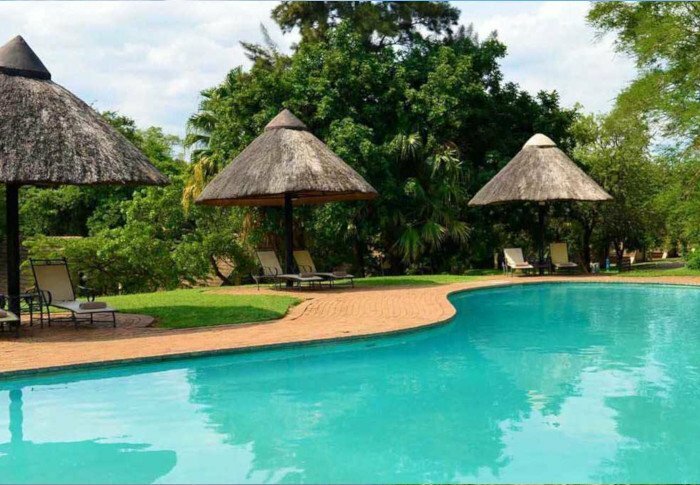 Protea Hotel Kruger Gate is located next to the Sabie River, overlooking Kruger National Park and just 100 metres from Paul Kruger Gate. 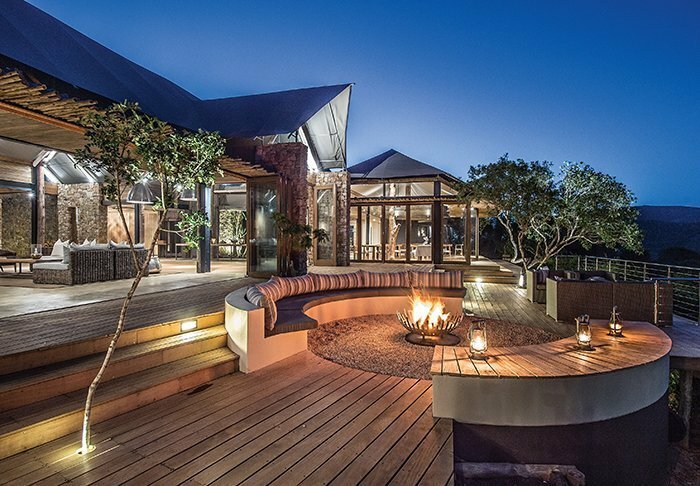 The lodge has numerous cosy lounge areas and wonderful vantage points with views of Kruger National Park. 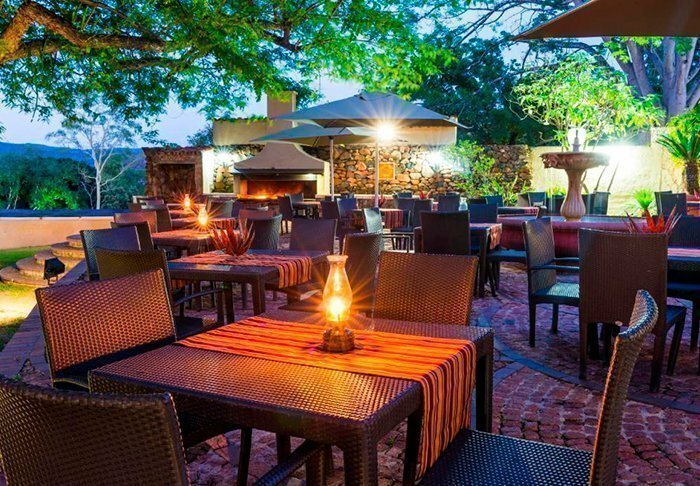 Protea Hotel Kruger Gate is a 4-star lodge, with facilities including a spa, tennis courts, mini-golf and a fitness room. 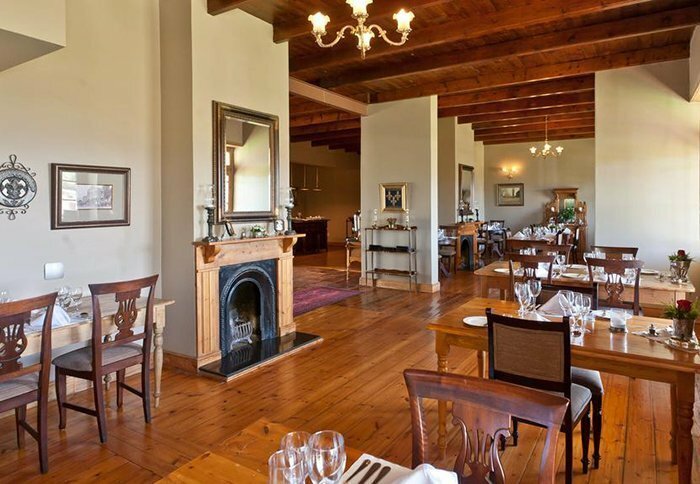 The rooms are large and inviting, and all present a view of the garden with its rich variety of birds and animals. 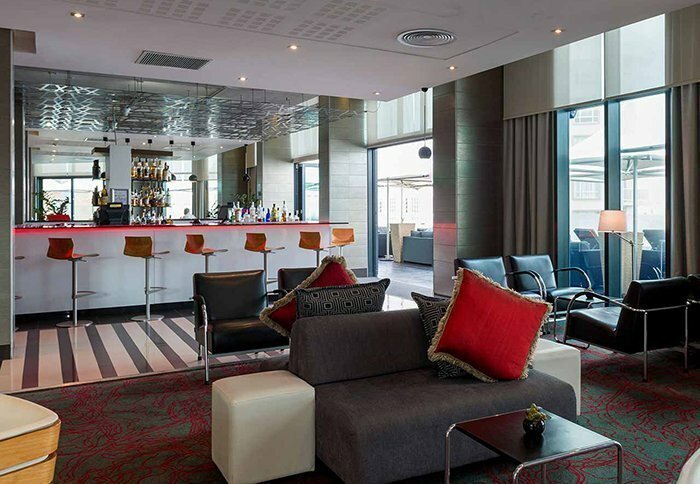 Moreover, they are fully appointed with air conditioning, TV, a safe, international plug sockets and a hair dryer. 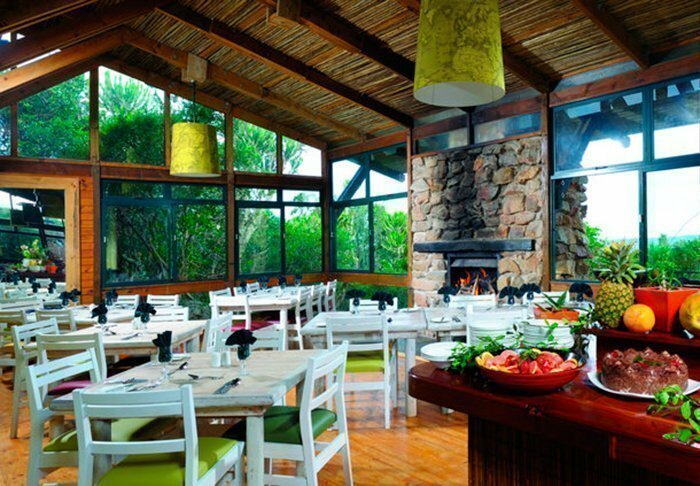 One of the lodge’s two restaurants – Lapa Restaurant – serves meals under the stars and presents a wide and tempting range of buffet dishes. 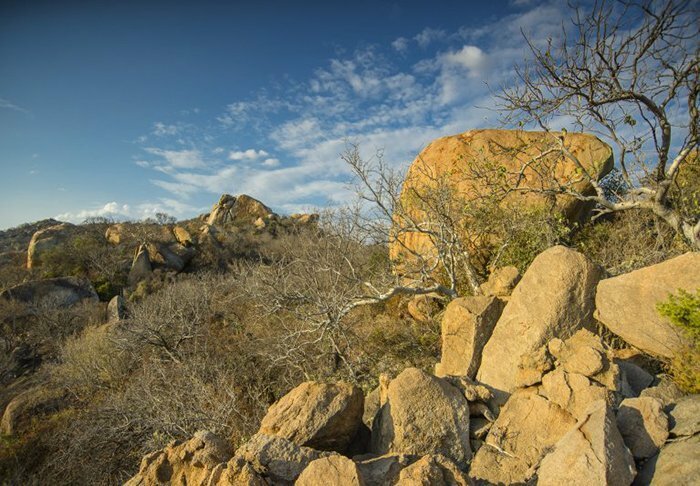 Boulders Safari Lodge is located in calm and peaceful surroundings in Boulders Game Reserve, to the south of Kruger National Park. 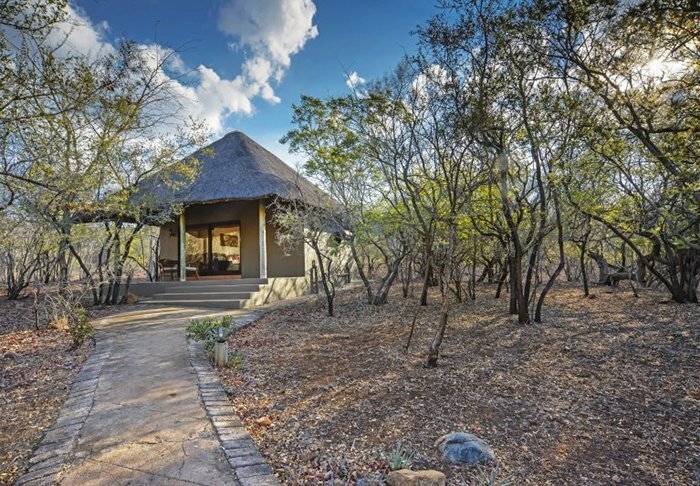 The lodge is situated in a lowveld area of grass, low bush and scrub where you can see a variety of animals including zebras, giraffes, buffalo, impala, kudu, Nyala antelopes and – if you are really lucky – the rare roan and sable antelopes. 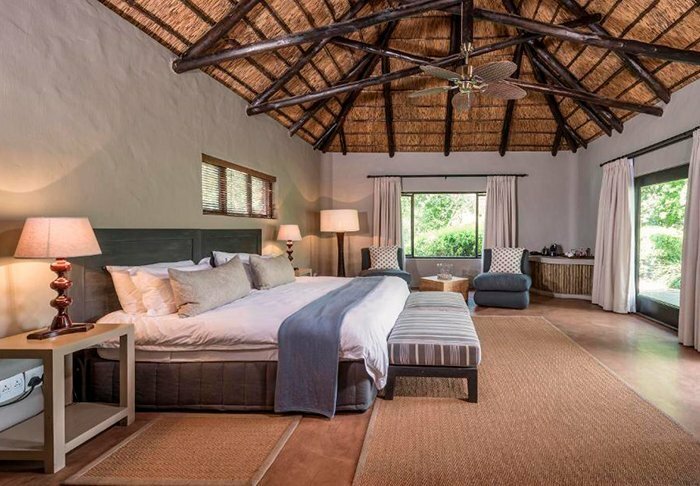 There are 26 spacious rooms at the lodge, all with stone floors and traditional thatched roofs. 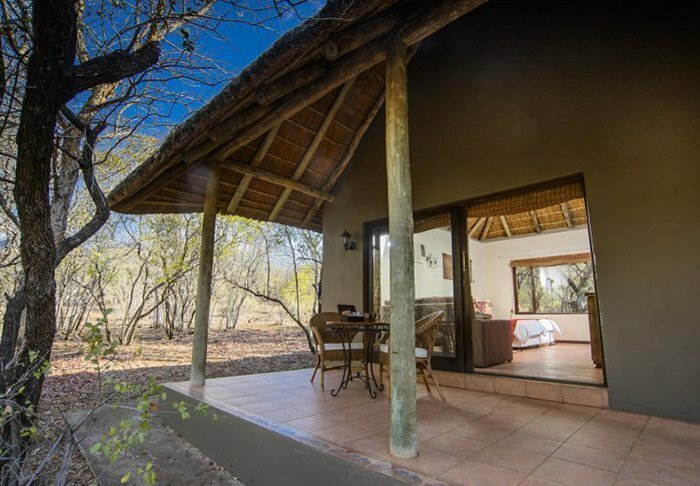 The rooms are appointed with comfortable beds, air conditioning and coffee/tea-making facilities, and they have a separate bathroom. 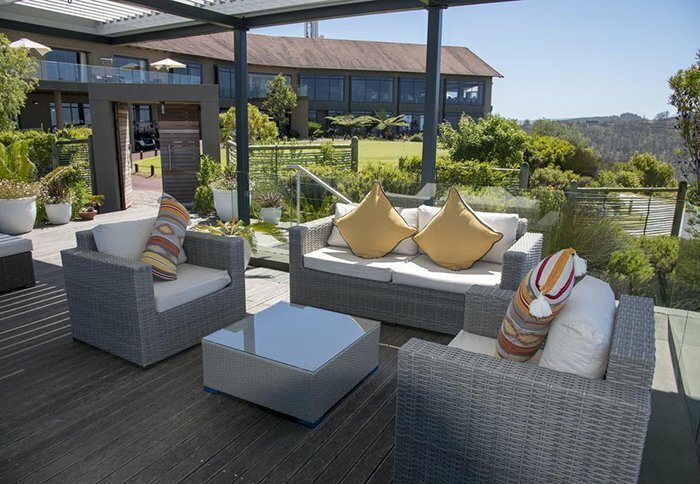 The terrace is the perfect place to relax with a good book and enjoy the stunning surroundings. 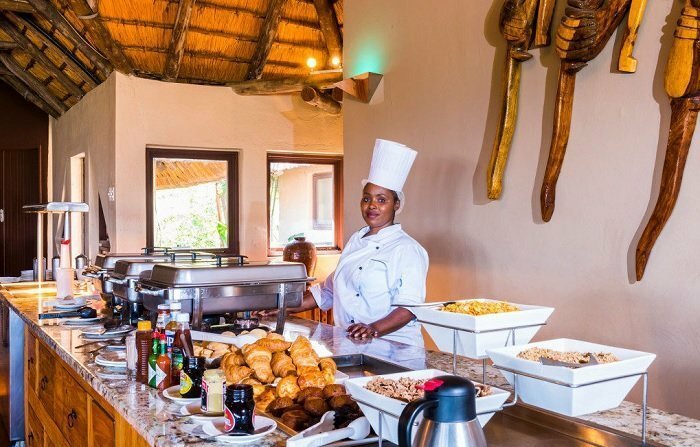 Facilities at Boulders Safari Lodge include a bar and restaurant serving drinks, an à la carte menu and a buffet. 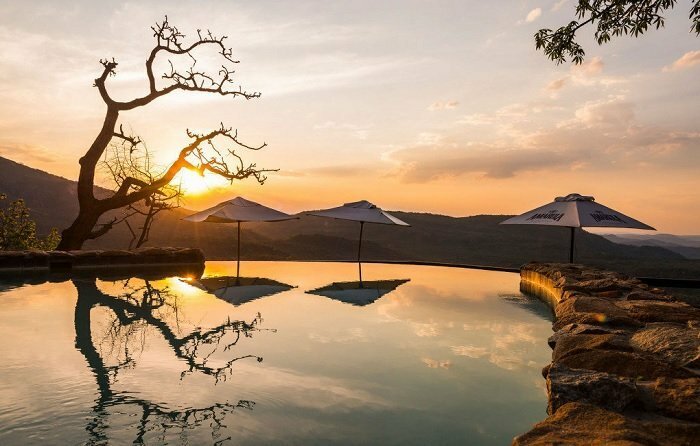 There is also a stone pool where you can take a refreshing dip in the water, as well as a lounge area where you can enjoy a sundowner against the backdrop of the almost magical sunset. 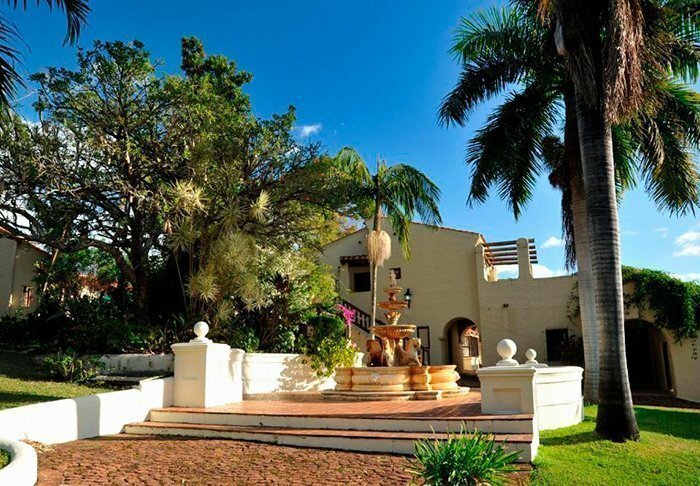 Inspired by Spanish culture, the Casa do Sol Hotel & Resort enjoys an excellent location close to the town of Hayzyview and just a 15 minute drive from Kruger National Park. 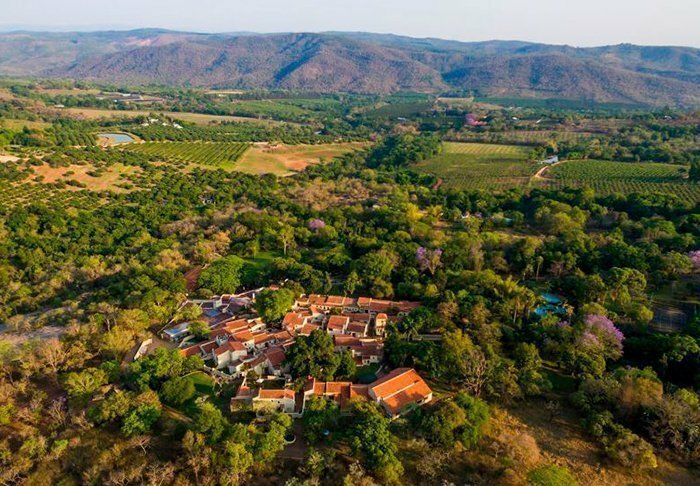 The resort is set in peaceful surroundings, with colourful flower gardens and delightful vantage points overlooking sights such as the Elephant Sanctuary, which is located right next door. 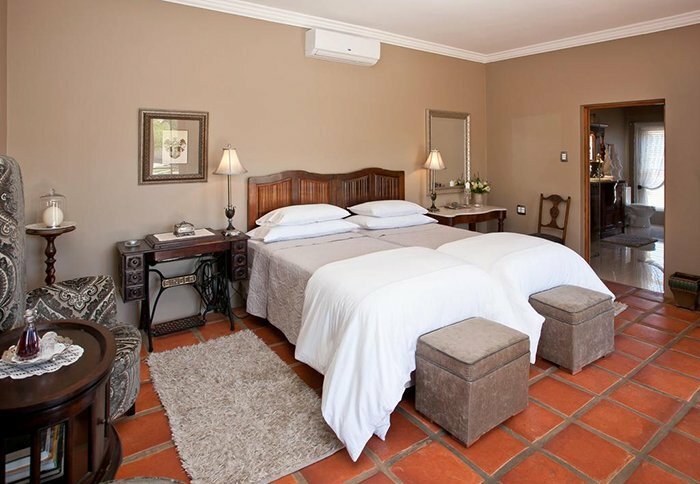 All rooms are decorated with local art, have a separate bathroom and toilet and feature a private exit into the garden, where there are tables and chairs for each room. 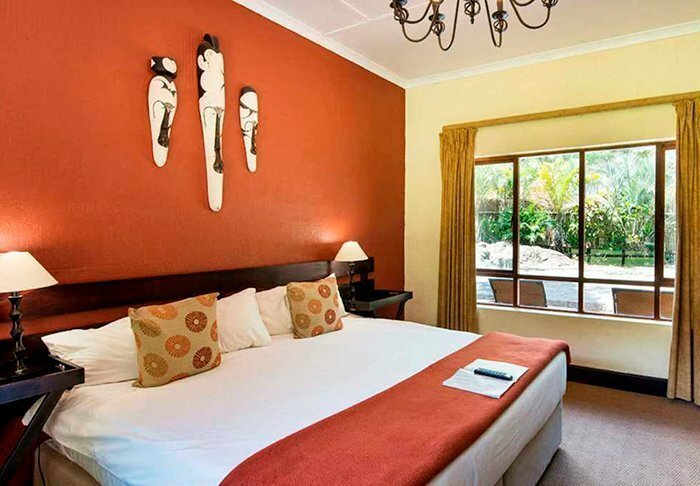 The rooms are fully appointed with air conditioning, TV, a safe, ironing board and hair dryer. 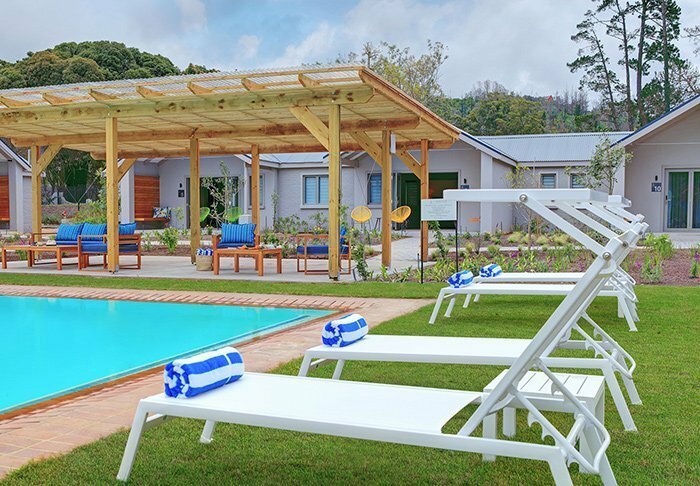 Casa Do Sol presents a warm, charming atmosphere, and facilities include a wonderful pool, a golf course (in the resort grounds), tennis courts and a spa. 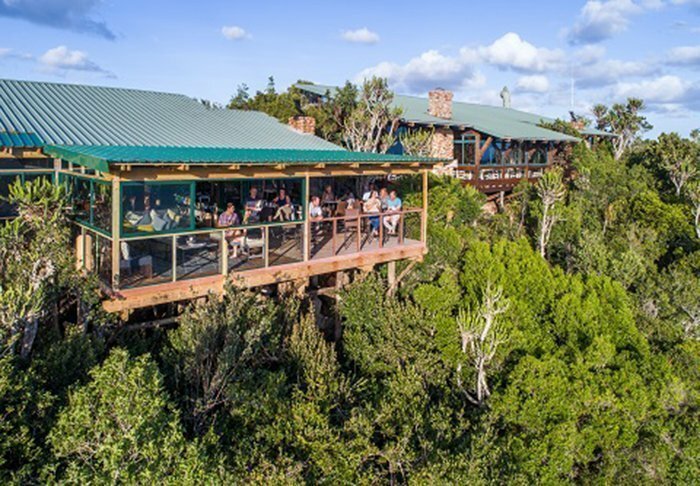 The 4-star Main Lodge is located in a fenced-off area on a ridge of hills in the Kariega Game Reserve. 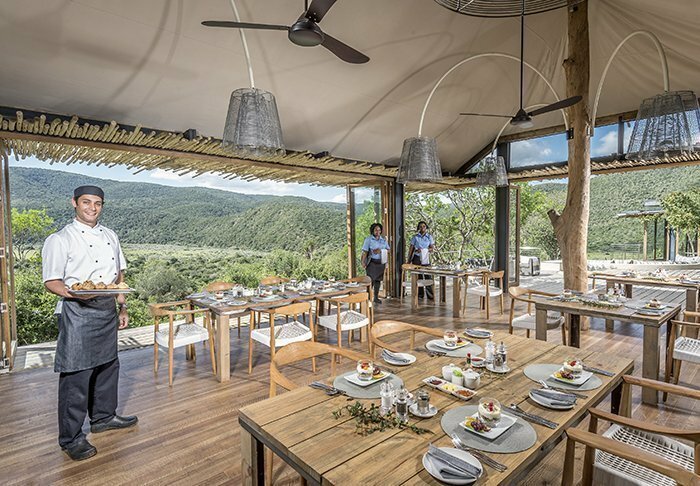 Thanks to this wonderful location, all chalets have an awe-inspiring view out over the reserve, with the opportunity to spot different animals directly from the balcony. 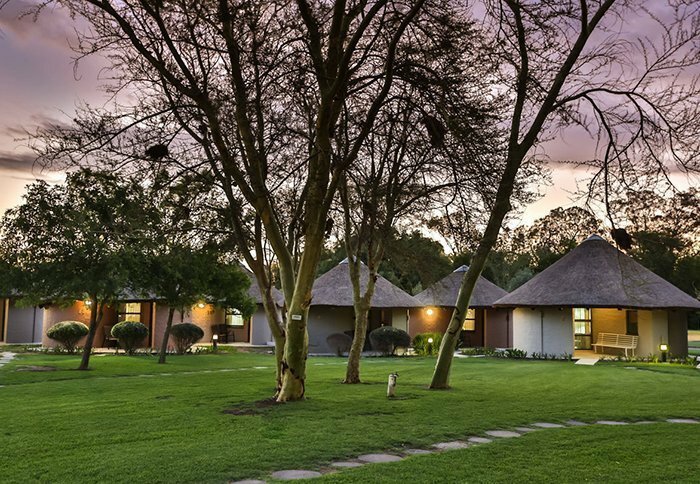 The Main Lodge comprises of 21 chalets, each at least 100 m² in size, 7 of which have one bedroom with en-suite, and 15 featuring several rooms with en-suite. 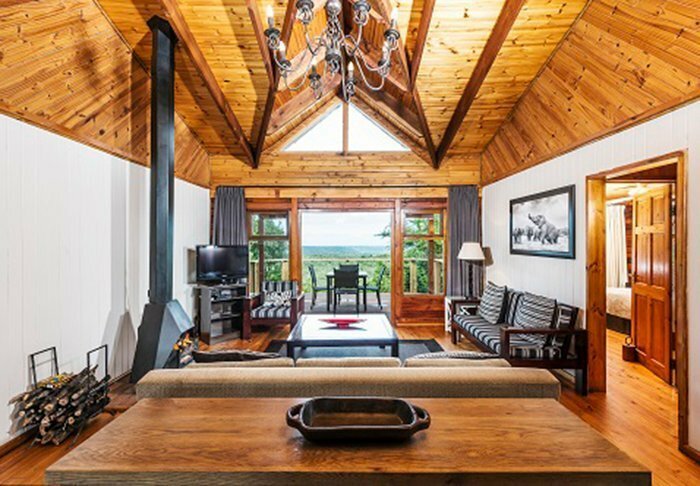 In addition, each chalet contains a large living area consisting of a kitchenette and living room. 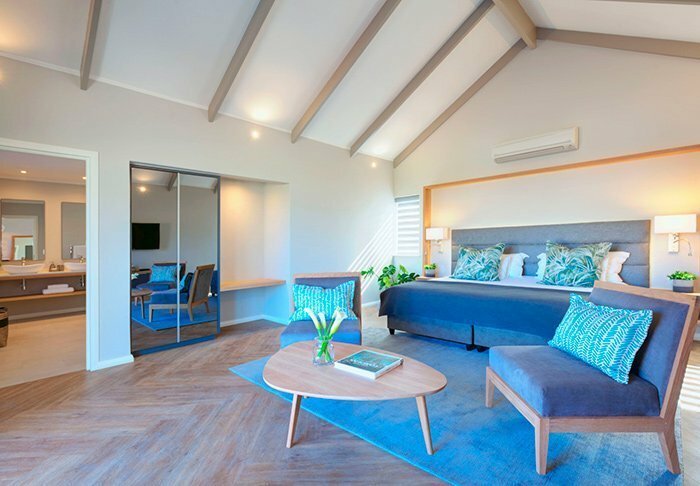 The rooms and the living area provide direct access to a spacious balcony, which is partially covered so that guests can always choose between sun and shade. 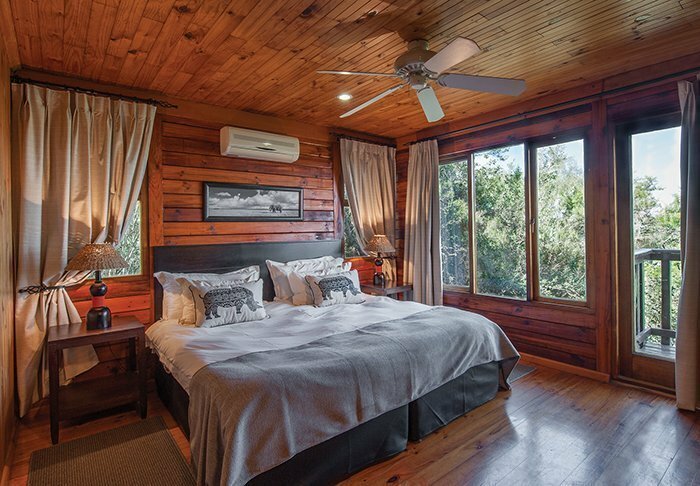 All chalets are equipped with air conditioning, a fireplace or wood-burning stove (for the cooler months) and facilities for making tea or coffee, satellite TV, a safe, telephone and internet connection. 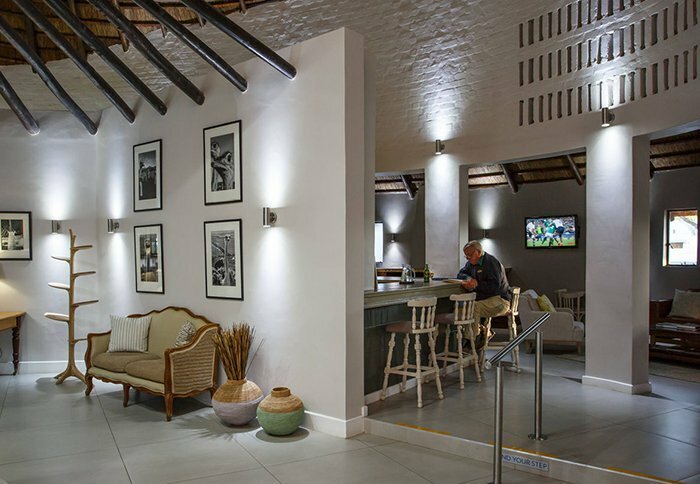 The lodge also offers a magnificent shared area with a restaurant, bar, viewing balcony, swimming pool, spa and a small souvenir shop. 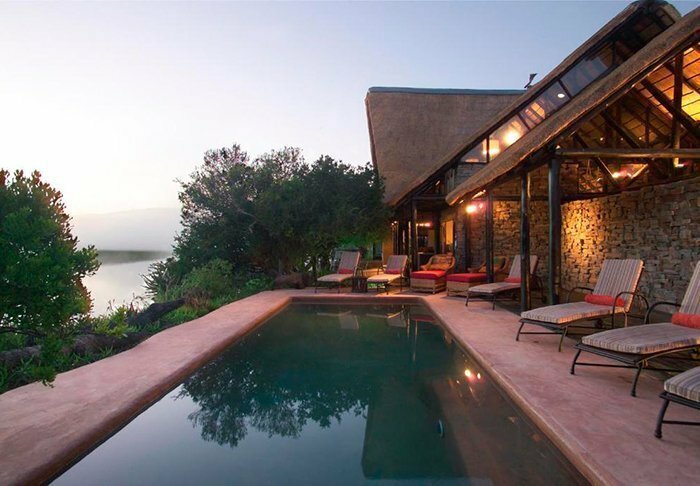 The 4-star River Lodge is located in the Kariega Game Reserve on the banks of – and almost extending into – Bushman’s River. 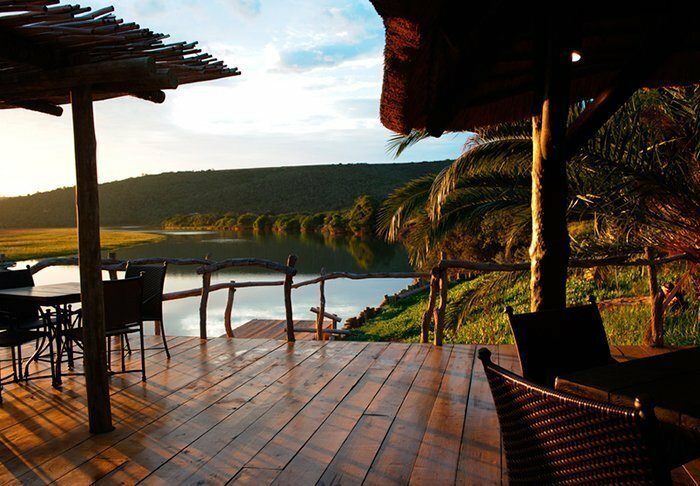 The way that the restaurant, bar and swimming pool have been constructed almost makes you feel that you are surrounded by the still, reflective water of the river. 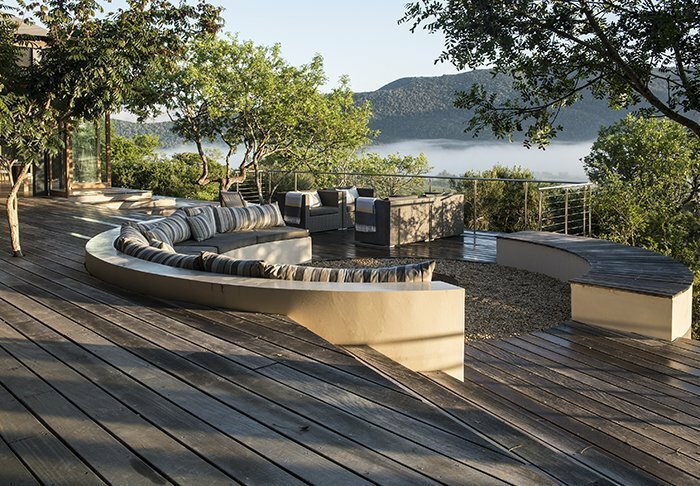 The lodge has a unique viewing terrace built out over the river. 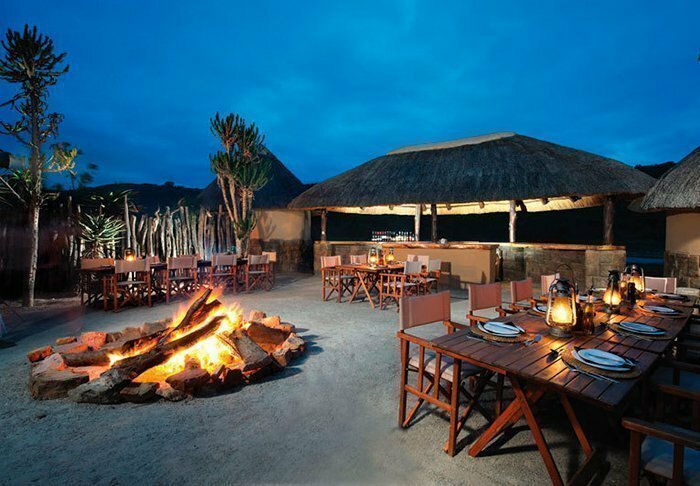 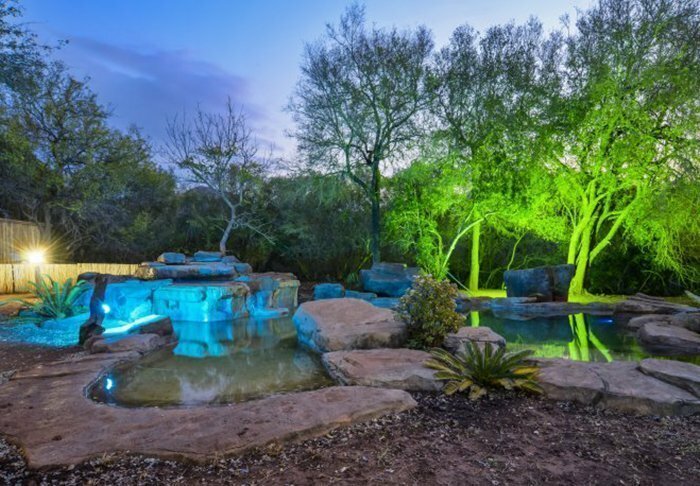 This is the perfect place to sip a drink at sunset, or to enjoy dinner under a starry sky. 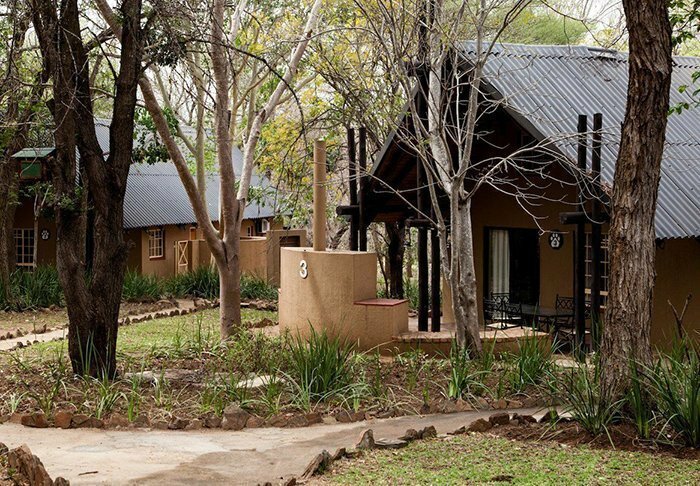 Privacy is the defining feature of the lodge and its suites, making this the ideal place to enjoy some peace and quiet. 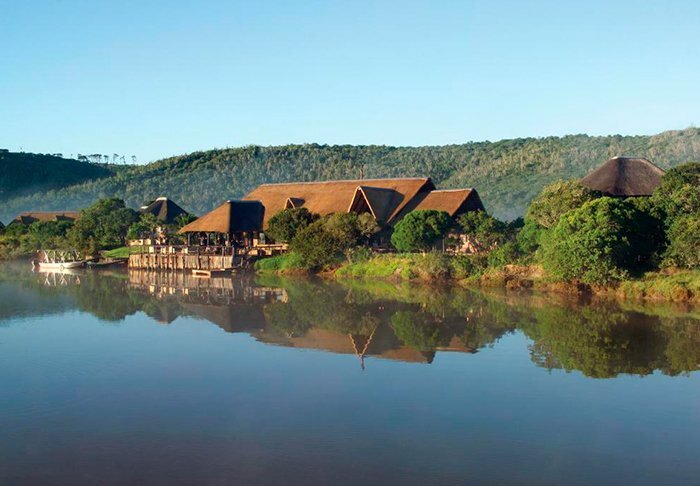 The lodge comprises of ten exclusive, luxury suites with thatched roofs, laid out at intervals along the river bank. 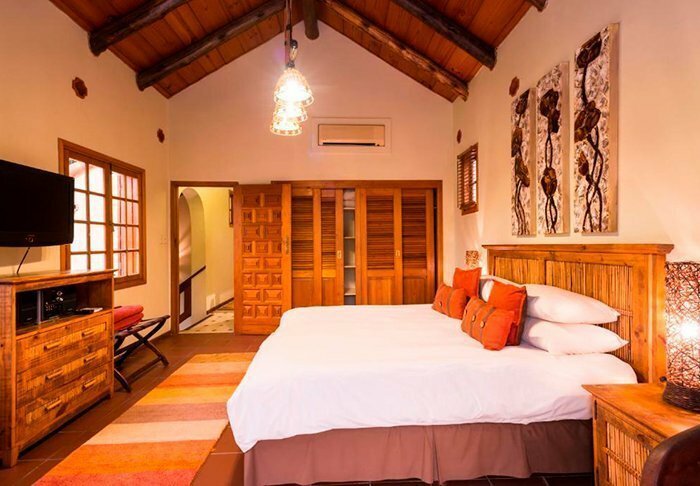 The suites are very spacious and decorated with examples of African art and crafts. 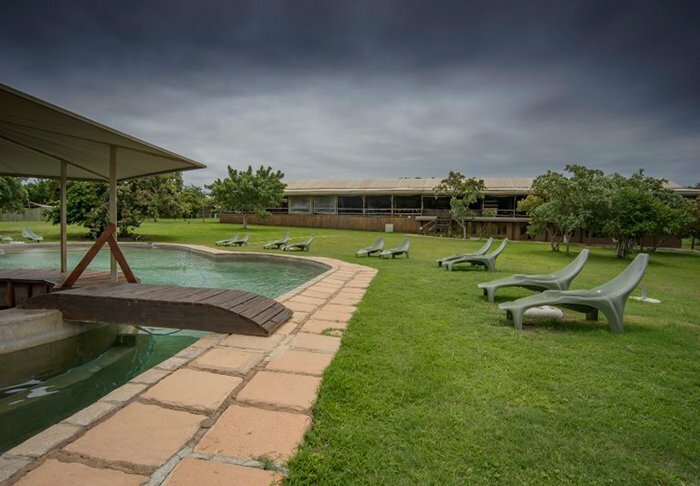 Each suite has its own viewing terrace, air conditioning, ceiling fan, internet, safe and telephone, as well as a well-appointed bathroom with a bathtub. 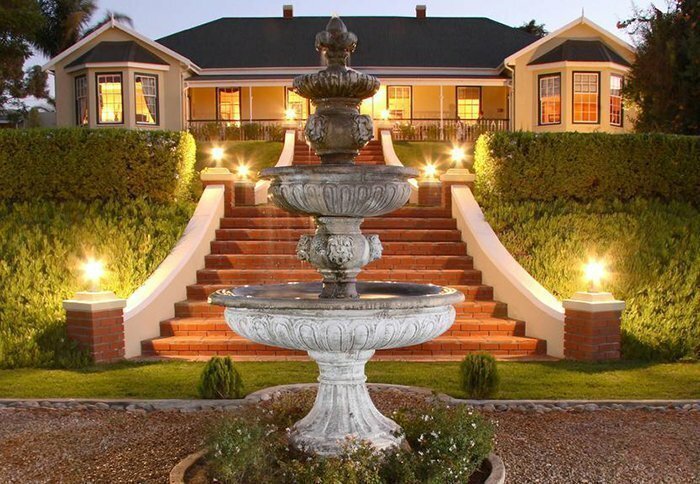 Children under the age of 10 are not permitted to stay here. 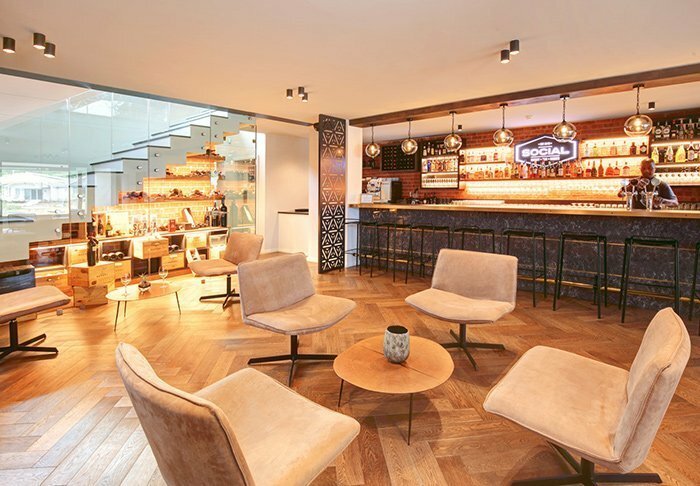 There is a TV in the communal area. 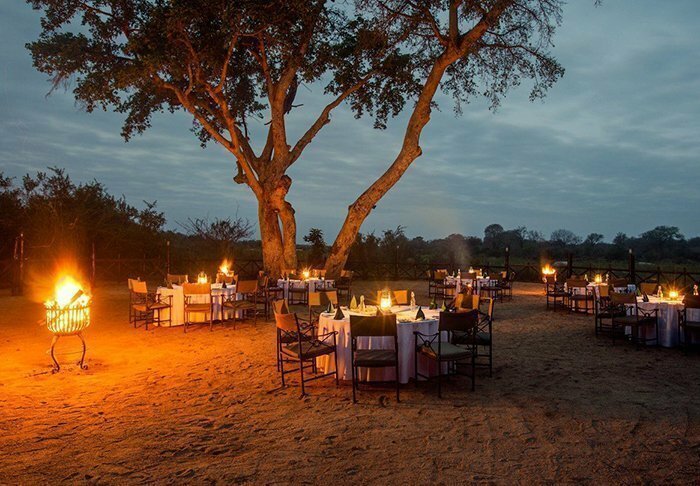 This exclusive 5-star lodge is African tent safari at its very best. 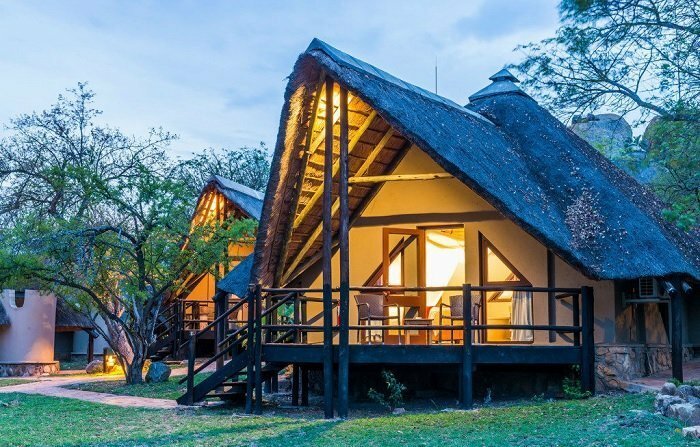 It has just nine luxury safari tents, all of which are “free standing” and therefore virtually function as their own little separate luxury lodges. 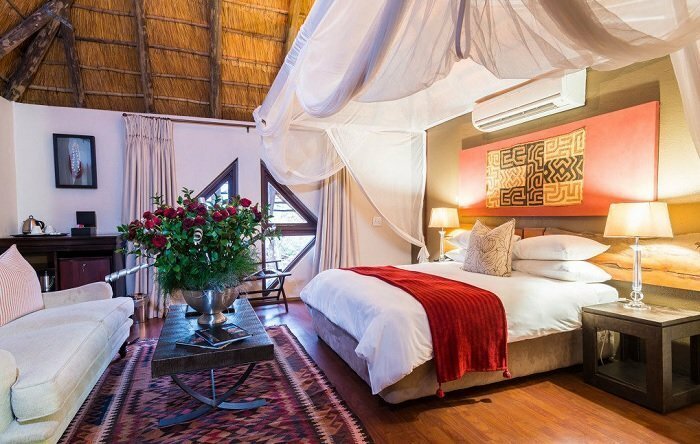 The tents are huge and consist of a living room, bedroom, large bathroom, indoor and outdoor shower, and from the private outdoor terrace, there are beautiful views of the river and the surrounding countryside. 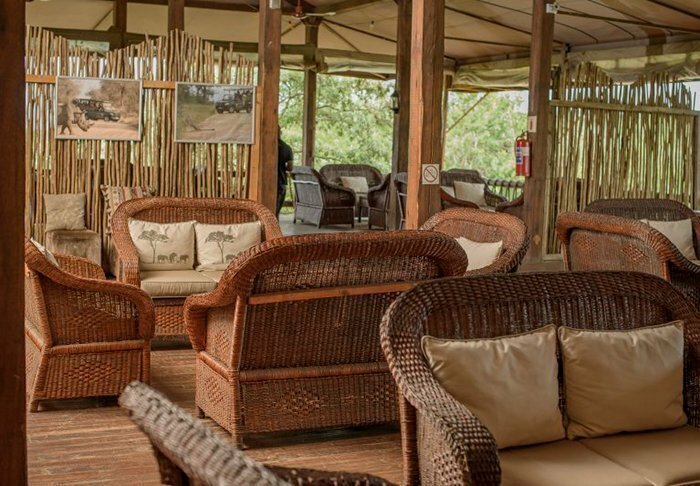 It goes without saying that all of the tents have air conditioning, tea and coffee making facilities, a mini bar, a safe and their own wood burning stove. 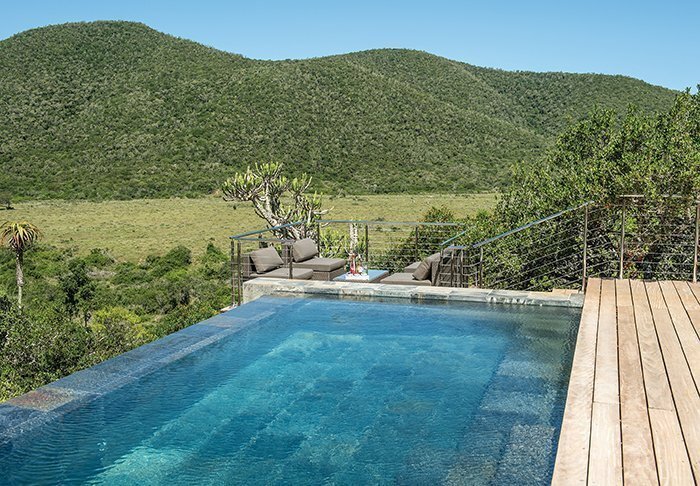 The entire lodge is built on a slope in a slightly secluded part of the wildlife reserve, ensuring that you enjoy unobstructed views of the nature right outside and that you are not disturbed. 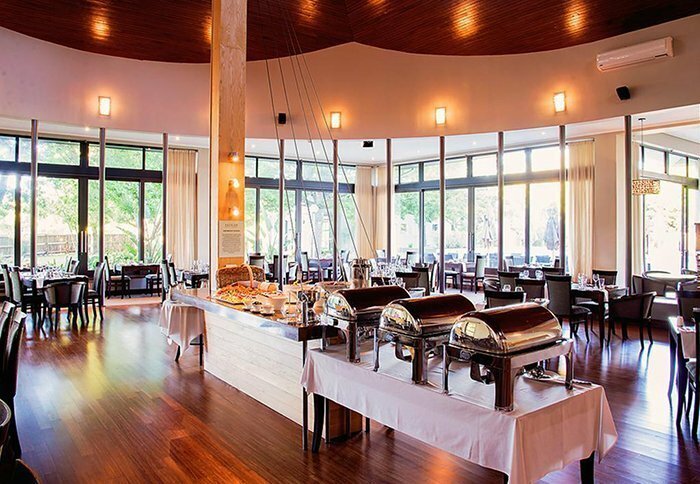 The tents are both modern and classically decorated. 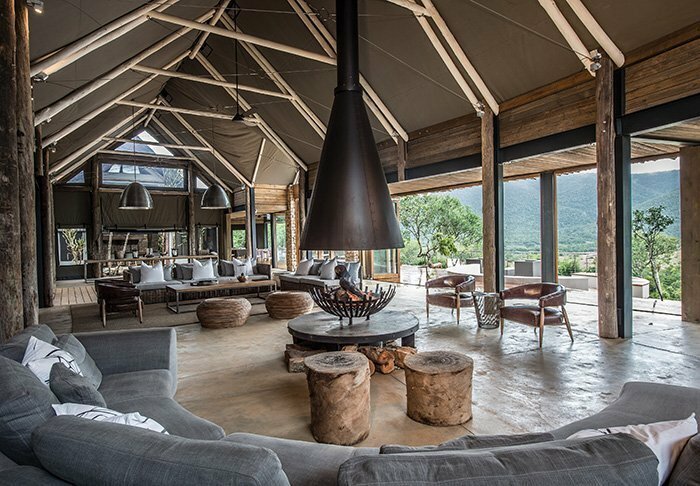 The colours are brown and beige – the “classic” safari colours – but stone, glass, wood and canvas have been used in the construction of the tents. 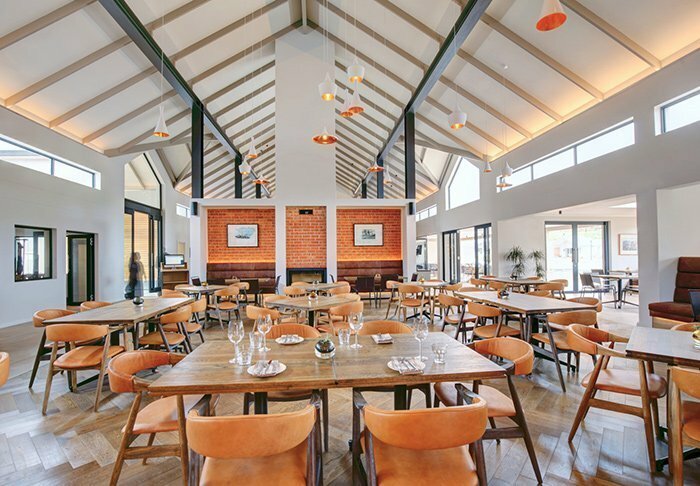 A modern yet classic feel permeates the entire lodge. 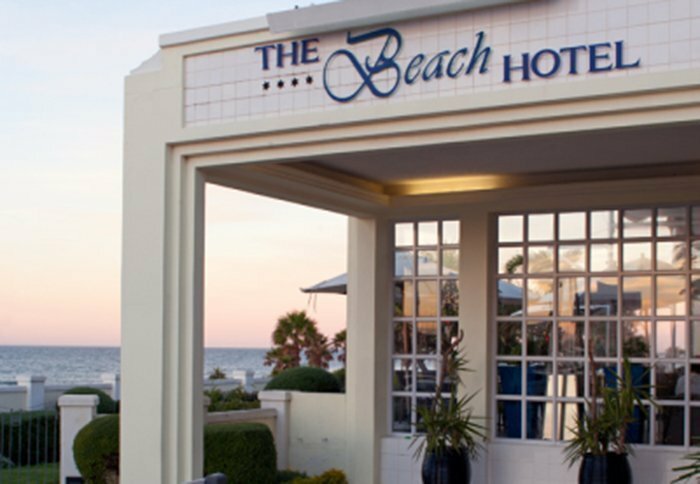 On the outskirts of the popular Port Elizabeth suburb Summerstrand, you will find the stylish 4-star The Beach Hotel. 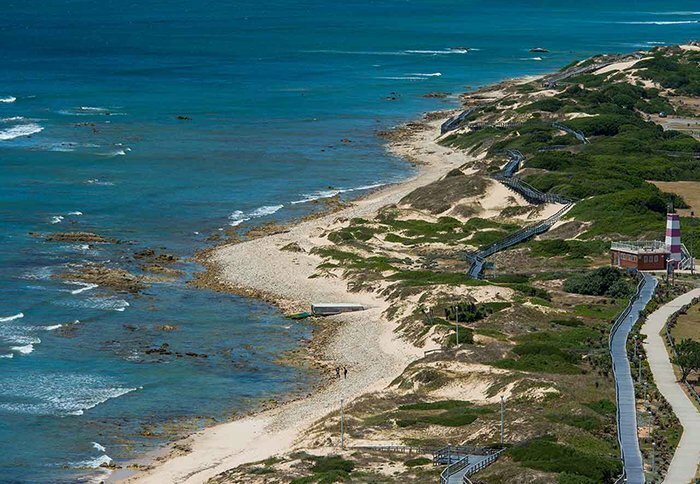 The name says it all really: Right opposite the hotel is one of the city’s best beaches. 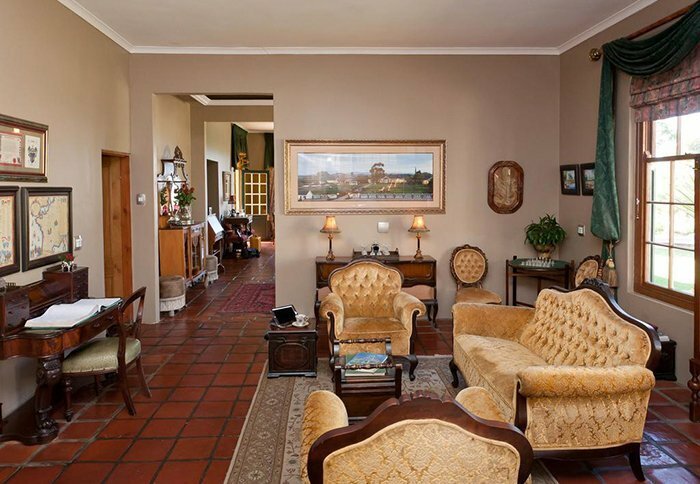 The historic city centre of Port Elizabeth is around 4 km from the hotel and you are just 5 km from the airport. 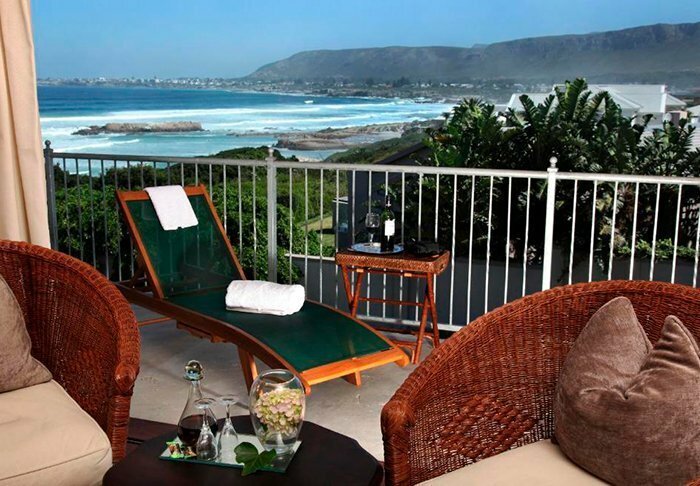 In other words: a hotel in a perfect location! 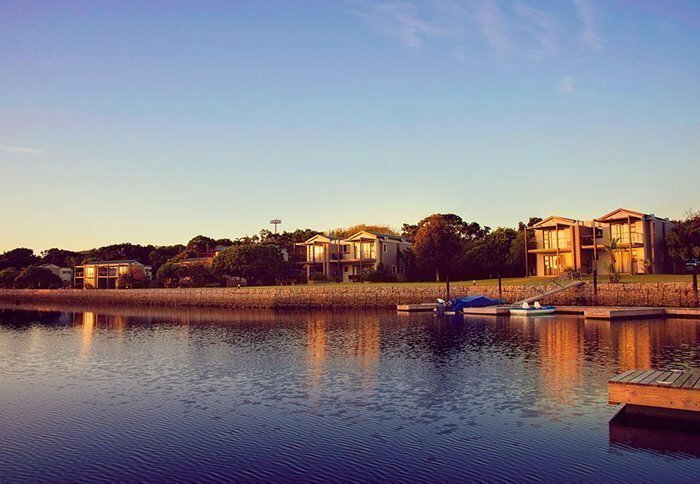 There are 58 rooms, all with air conditioning, minibar, tea/coffee-making facilities, safe, flatscreen TV and free Wi-Fi. 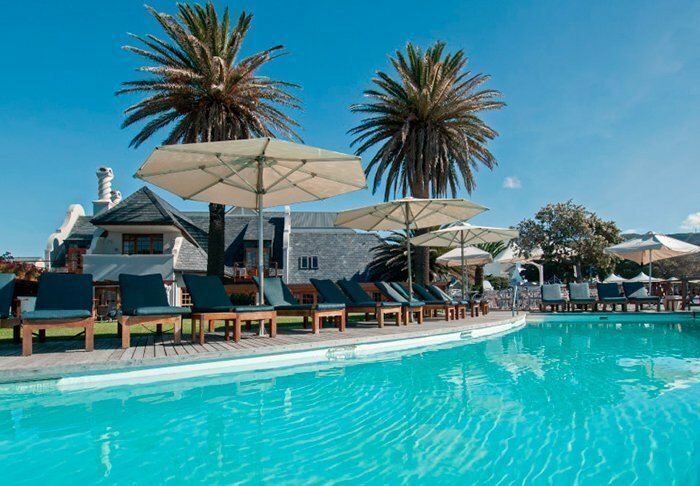 The hotel has a swimming pool with sun loungers, three restaurants and a bar. 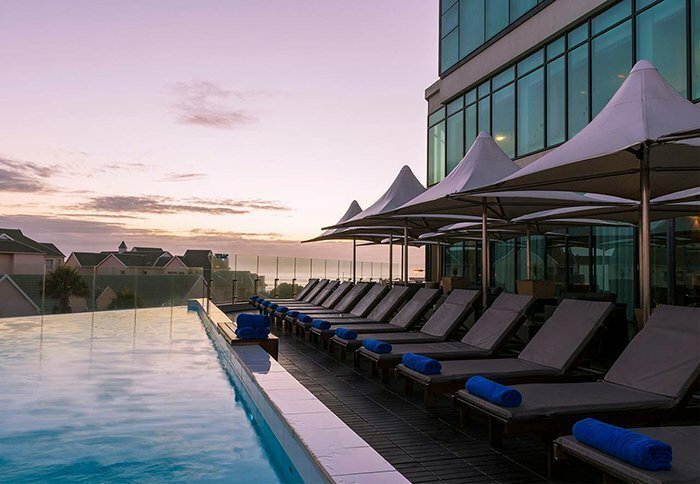 The latter are often popular at sunset – who doesn’t want to enjoy watching the sun set over the Indian Ocean with a cool drink in their hand? 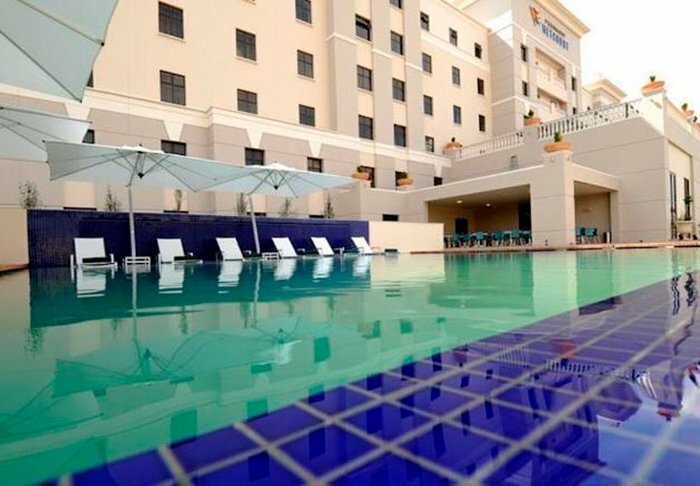 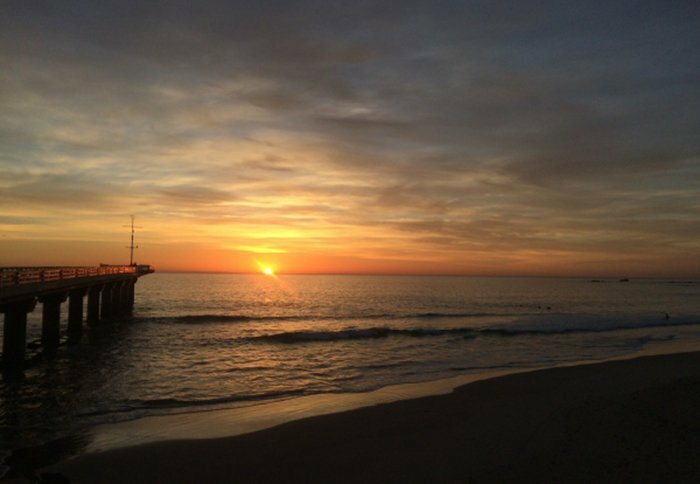 300 metres from Port Elizabeth’s famous Hobie Beach is the 5-star Radisson Blue Hotel. 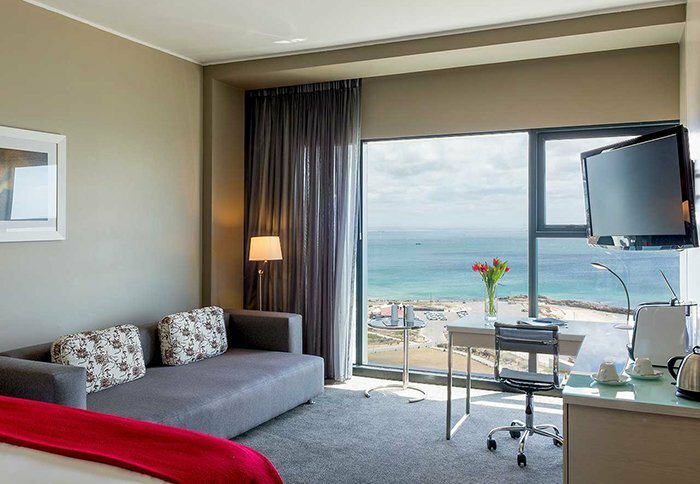 The hotel has 173 rooms, all with large floor-to-ceiling windows and views of the Indian Ocean. 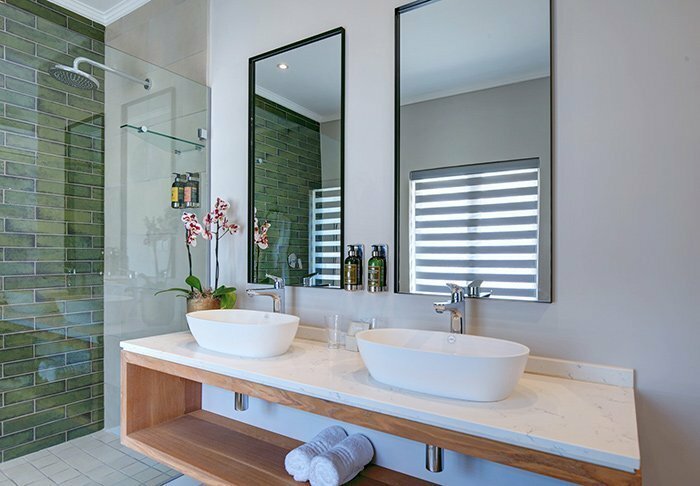 The rooms are modernly appointed in bright, welcoming colours, with the bathroom as an integral part of the room itself. 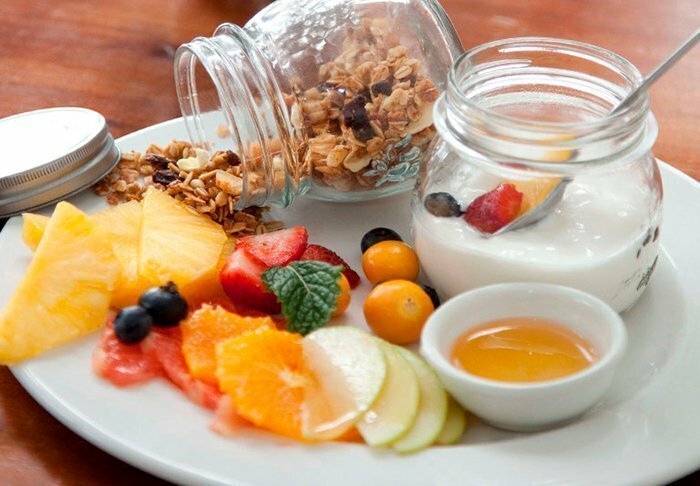 There is free Wi-Fi in all rooms, as well as a fridge, safe and tea and coffee making facilities. 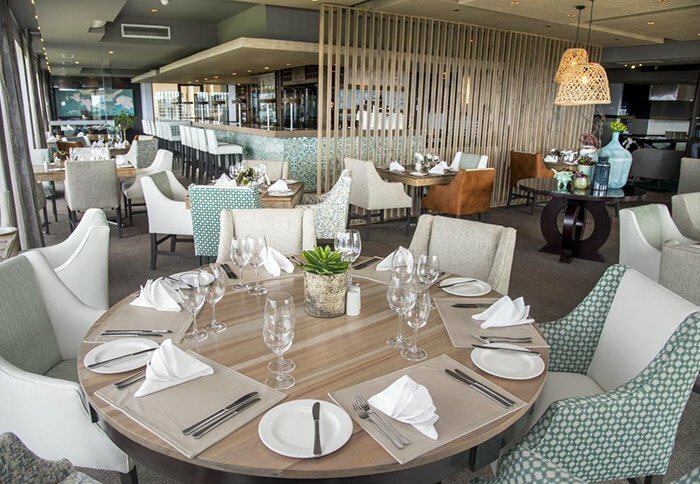 The Radisson Blu has its own restaurant and bar, and you can work off the calories with a dip in the pool or at the hotel’s gym. 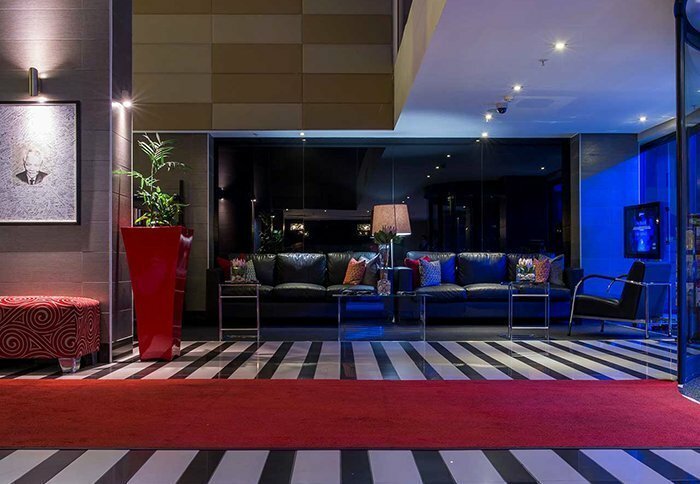 If you have a hire car, there is free parking at the hotel. 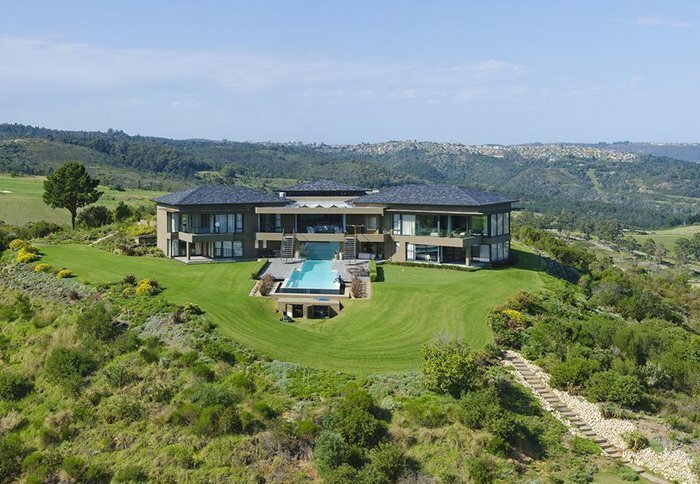 Situated like a little oasis at the heart of the Garden Route is Knysna Hollow Country Estate. 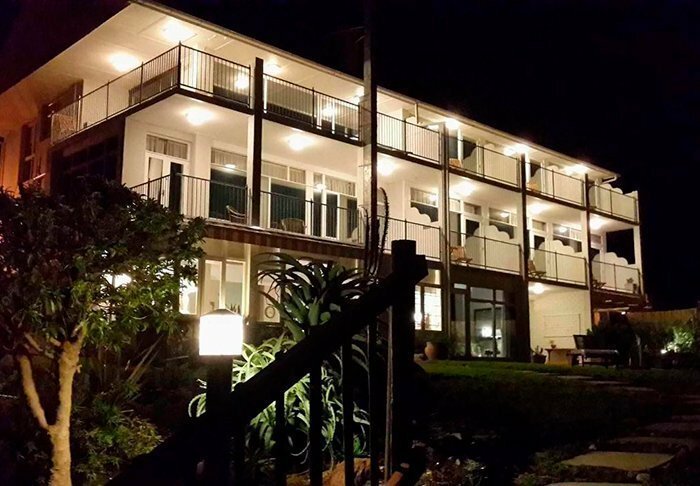 Located on the edge of the picturesque seaside resort of Knysna, the hotel provides the ideal base for exploring the area’s stunning scenery and countless attractions. 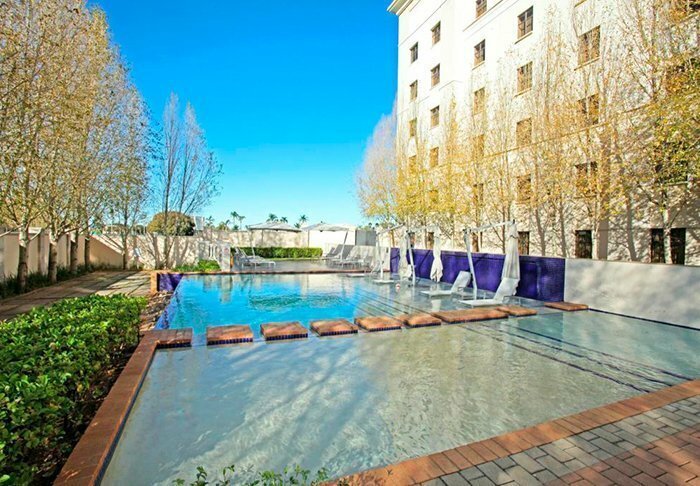 The entire hotel is stylishly appointed in soft tones in keeping with the surrounding nature and contributing to the peaceful, oasis-like environment. 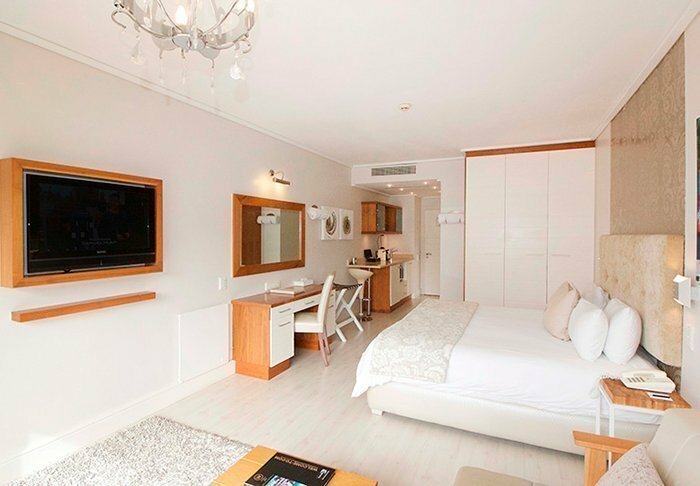 There are 44 spacious, modern rooms equipped with tea/coffee making facilities in the form of Nespresso machines, air conditioning, satellite TV, a safe, a mini fridge, a hair dryer, L’Occitane toiletries and USB sockets. 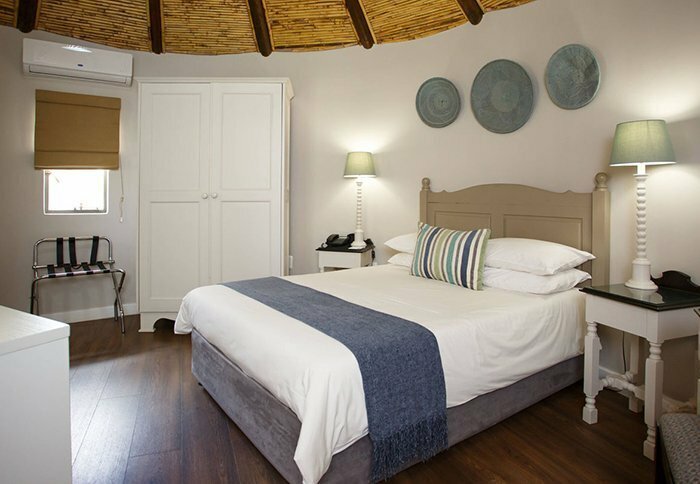 All rooms have a cosy private terrace or balcony overlooking the garden and one of the two swimming pools. 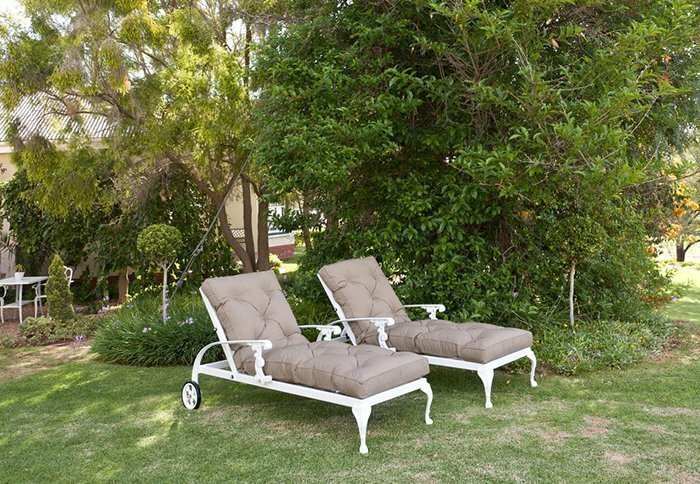 Next to each swimming pool, there is a small outdoor lounge area, perfect for relaxing in the lush nature. 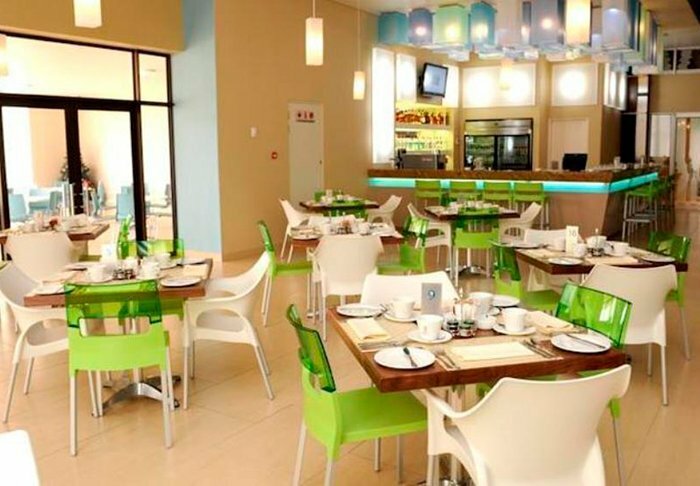 A continental breakfast is served in the hotel’s restaurant and bar, Social Eatery & Bar, where you can buy local authentic dishes, enjoy a craft beer or taste the wide variety of unique South African wines at other times of the day. 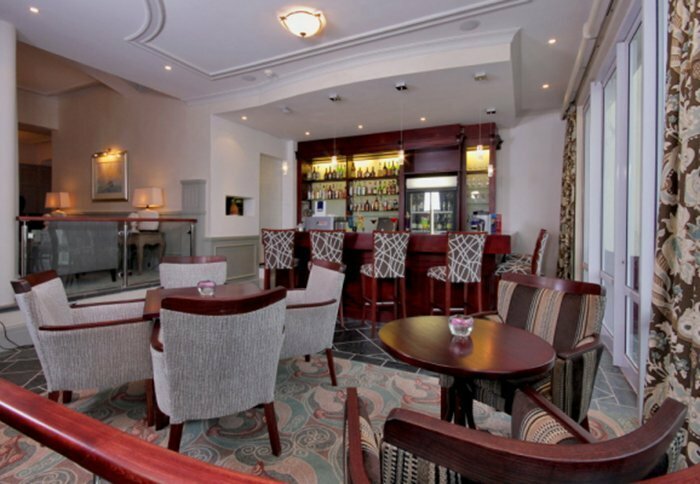 In reception, there is a cosy little lounge area furnished with comfortable chairs, and you can also rent bicycles to explore the town here. 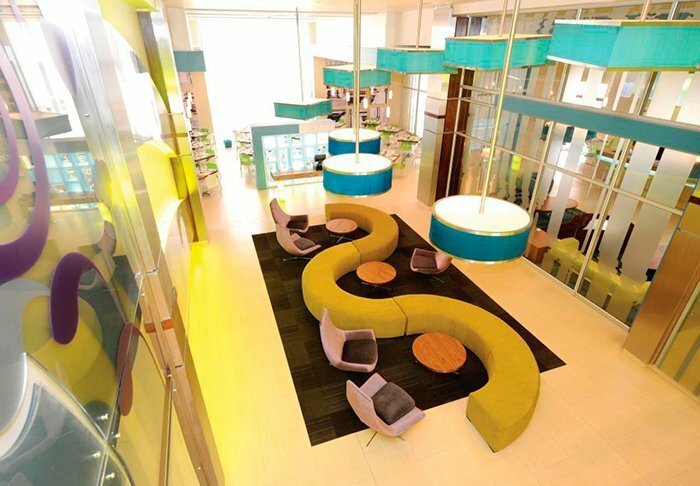 The hotel also offers free Wi-Fi and good parking. 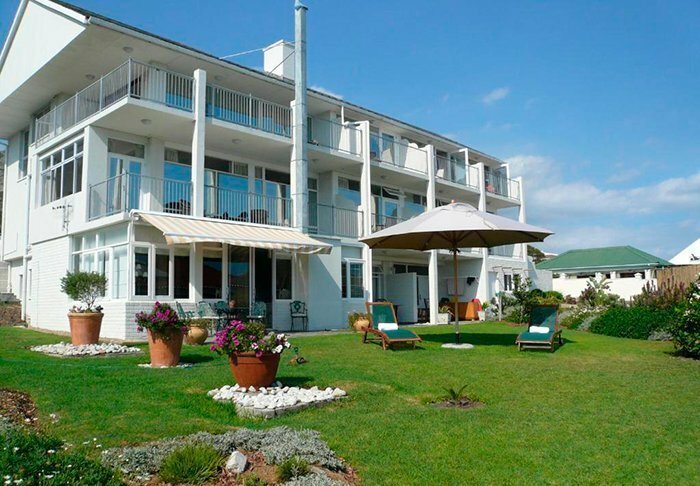 The 4-star Premier Resort The Moorings is located right between Knysna’s popular Waterfront area with its shops and restaurants, and the viewpoint on the eastern side of the approach to the lagoon. 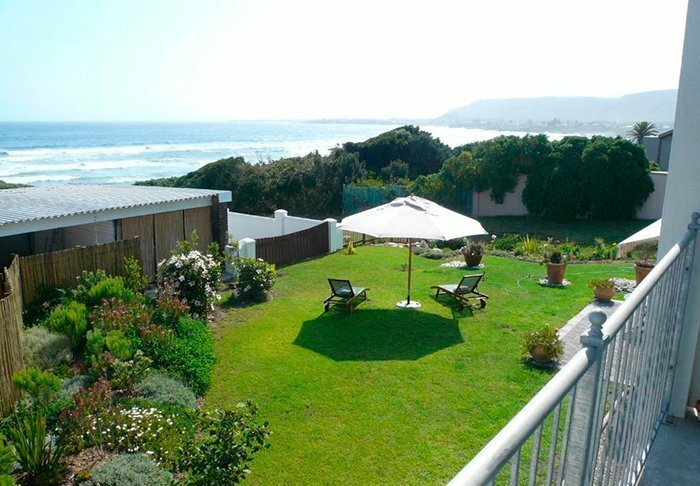 From the large, green garden, you have a beautiful view of the water and Knysna Heads. 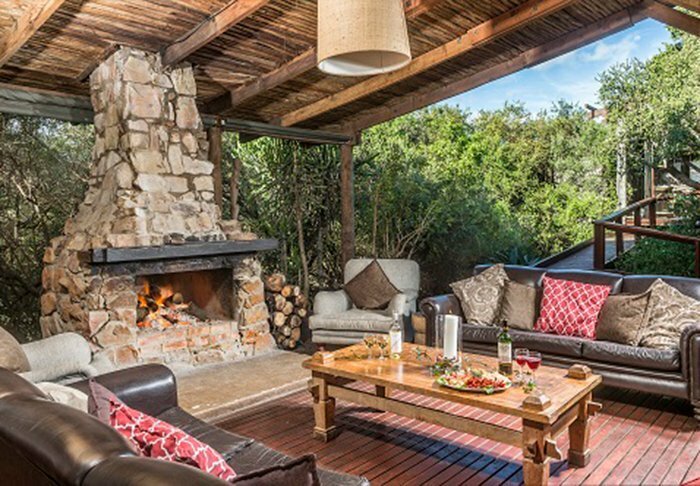 There are 74 well-appointed rooms, all with air conditioning, a flat-screen TV, tea and coffee facilities and a private terrace or balcony. 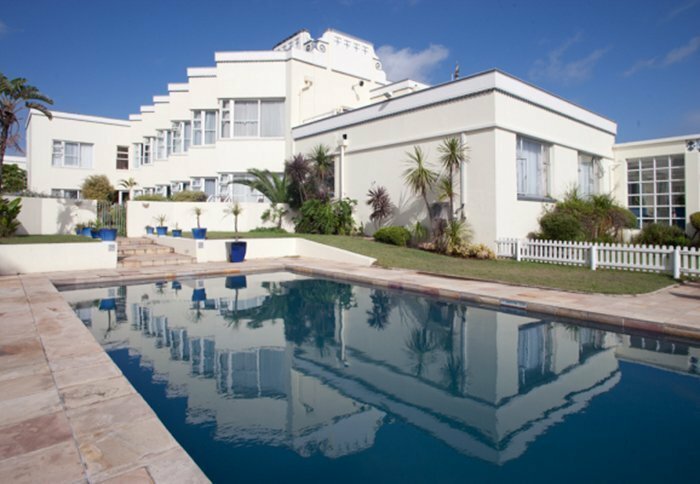 The hotel offers good parking, a lovely pool and sun loungers in the garden, a restaurant, bar and free Wi-Fi. 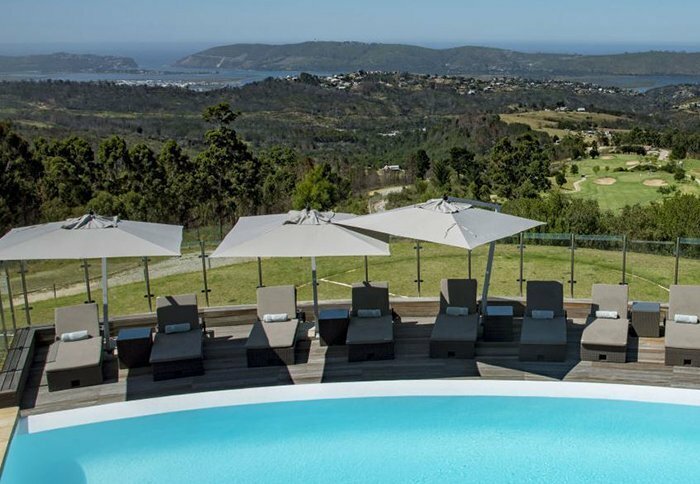 The 5-star Simola Hotel Country Club is probably the hotel in Knysna with the best view. 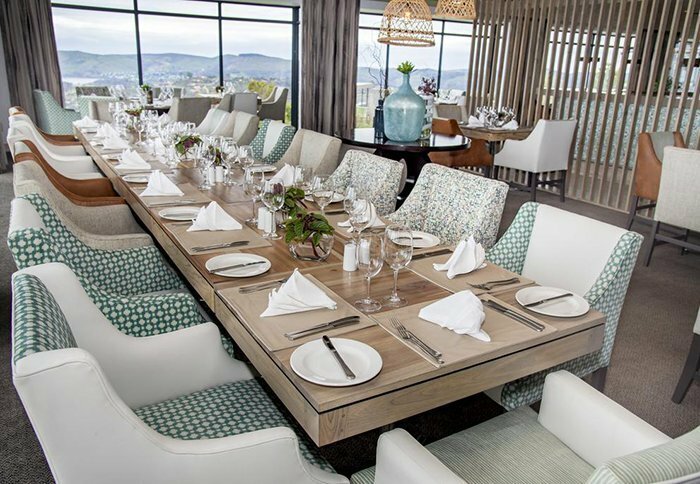 The hotel is located high in the hills a little outside the town centre, and from the hotel restaurant, you have the most amazing view of the lagoon and the surrounding countryside. 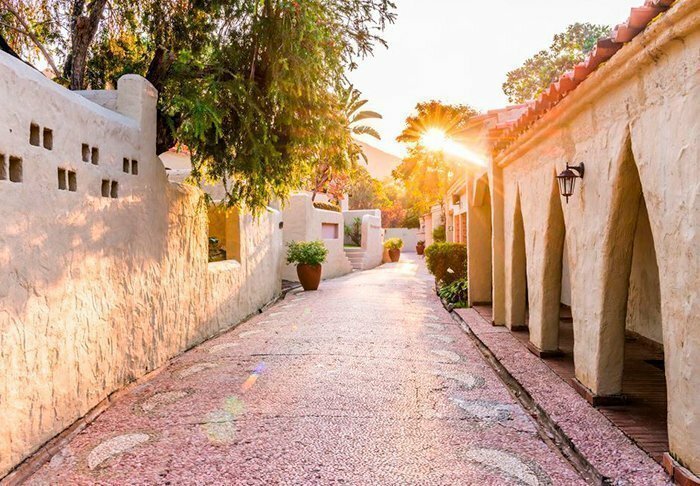 Next to the hotel is one of the country’s best golf courses, and the surroundings are ideal for walks or runs along the numerous trails around the hotel. 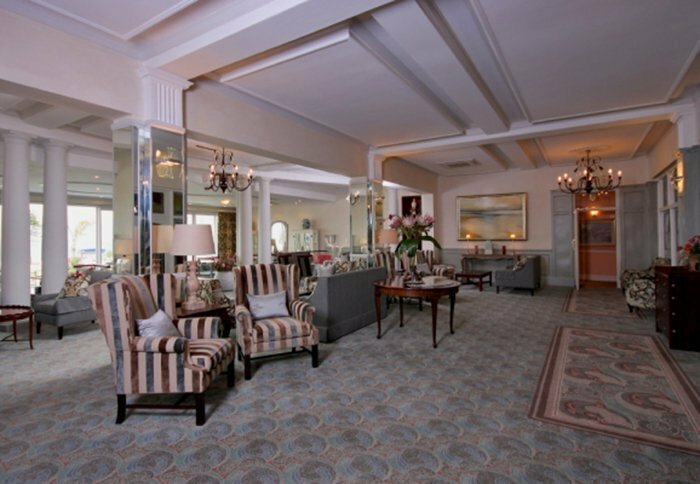 The hotel has 80 well-appointed rooms, all with an en suite bathroom, air conditioning, safe, TV, DVD player and free Wi-Fi. 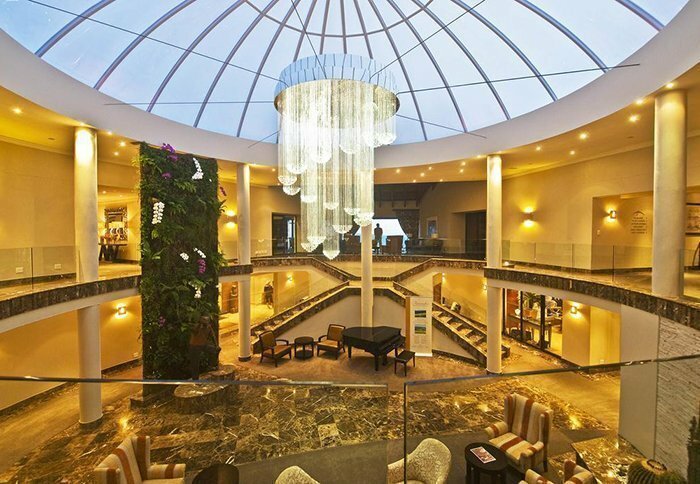 The hotel has a spa, pool and gym as well as its own restaurant and bar. 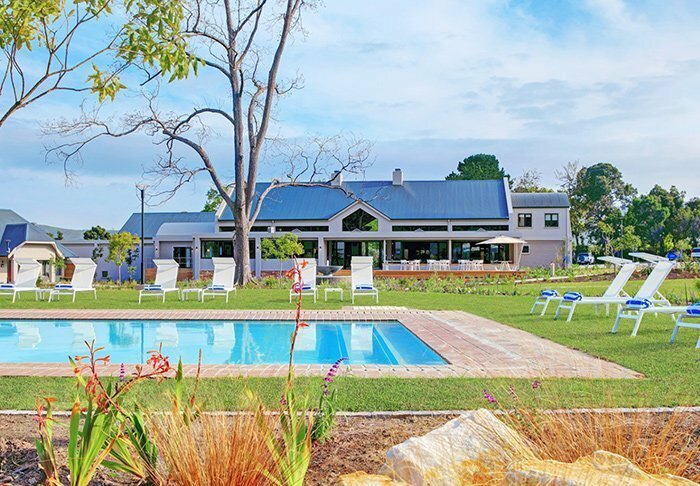 In large private grounds on the outskirts of Oudtshoorn, you will find the 3-star Protea Hotel Rimpie Estate. 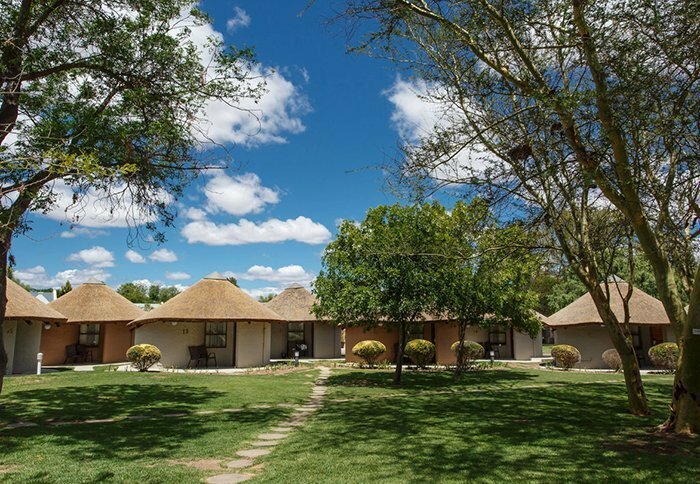 The rooms, which are housed in rondavels – typical African round huts with a thatched roof – are dotted about the large, green garden, making it feel almost like you are staying in a small park. 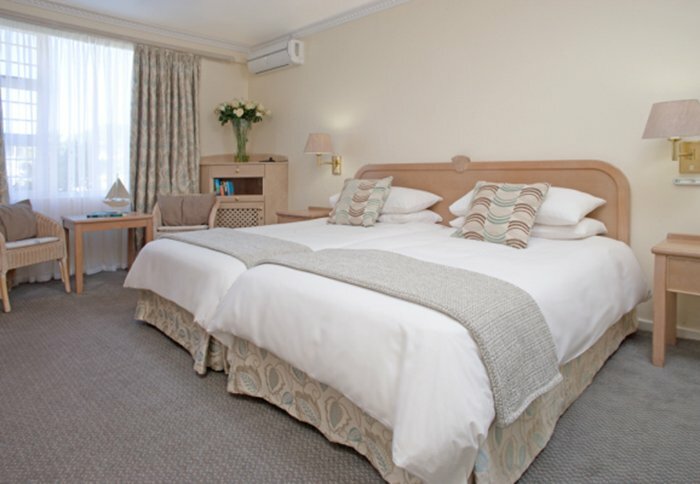 All rooms have an en suite bathroom, air conditioning, tea/coffee making facilities, TV and free Wi-Fi. 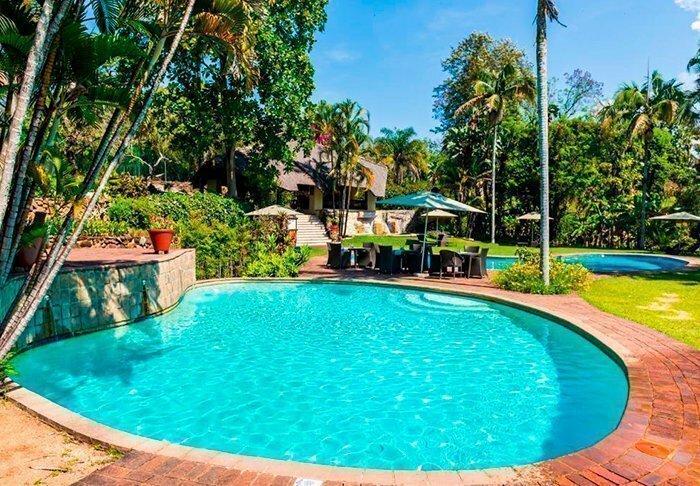 The location couldn’t be more perfect – just a 20-minute drive from Cango Caves, and you can look forward to a dip in the pool after the day’s drive through the beautiful yet arid landscape. 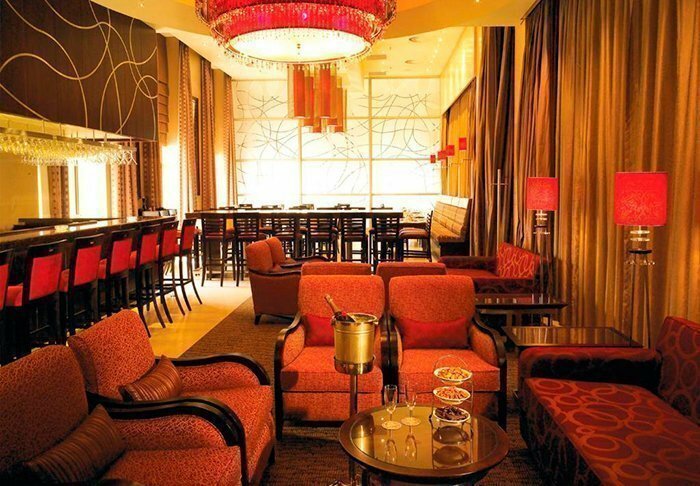 Free parking is available at the hotel. 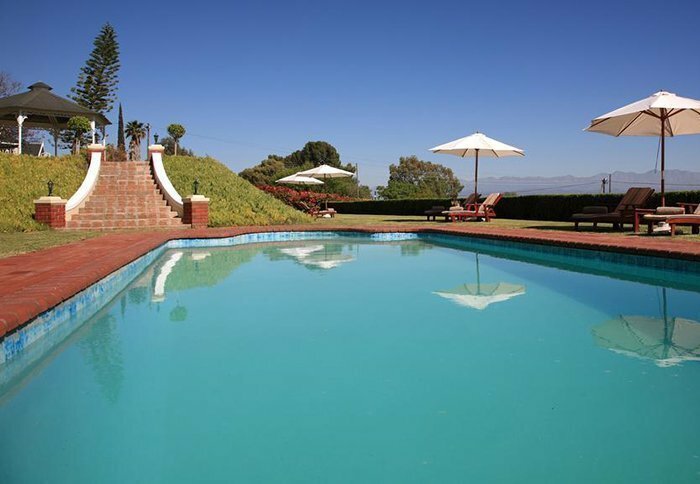 La Plume Boutique Hotel is located at a working ostrich farm outside Oudtshoorn. 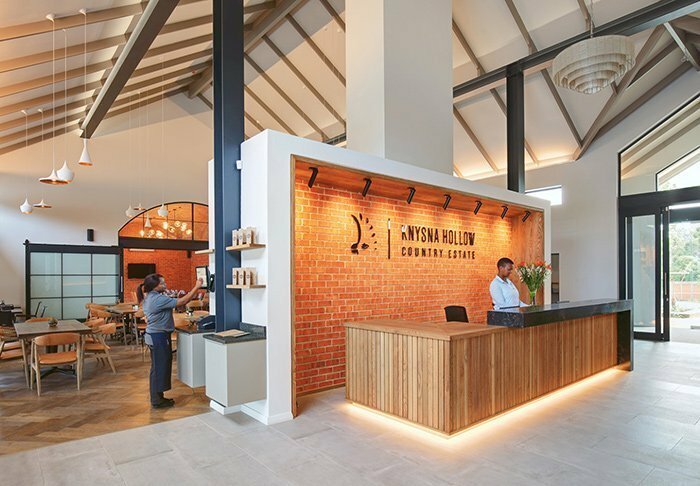 The hotel occupies an old Victorian house from 1904, which has undergone continuous renovation, and has charm and colonial style by the bucket-load. 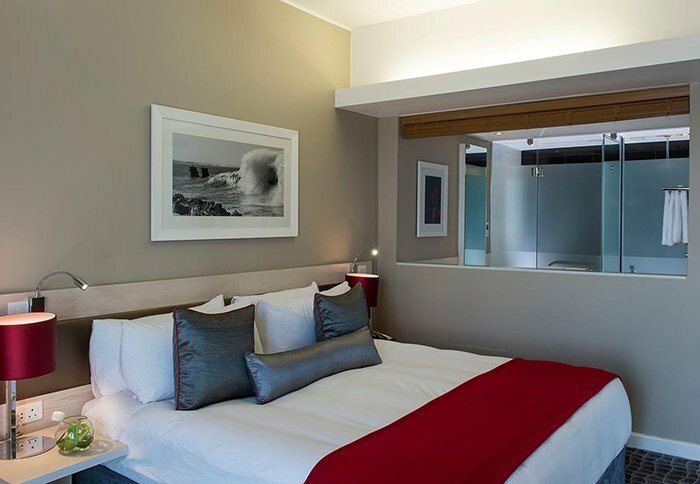 The 4-star hotel comprises 20 individually appointed rooms, each with its own en suite bathroom, flat-screen TV, free Wi-Fi and minibar. 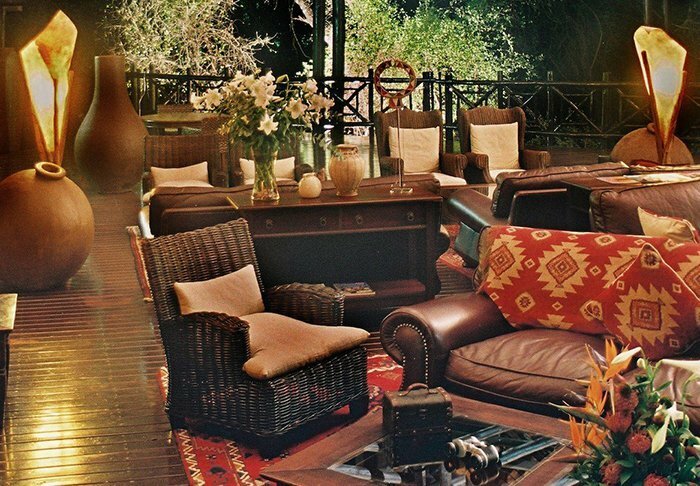 All rooms have their own veranda overlooking the lush garden surrounding the hotel. 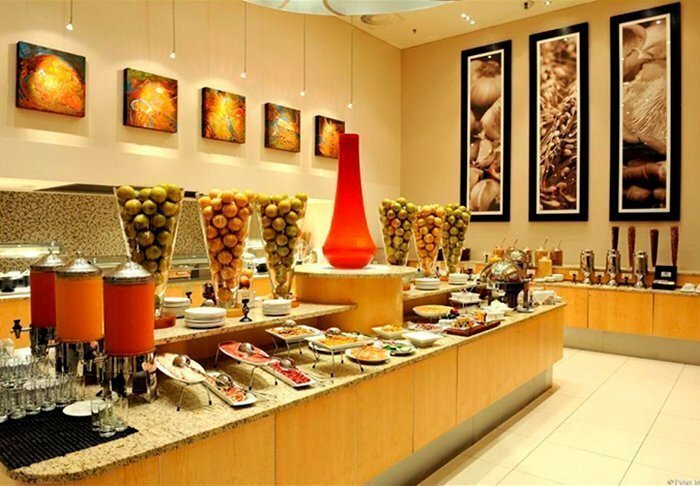 The hotel has its own restaurant where breakfast, lunch and dinner are served. 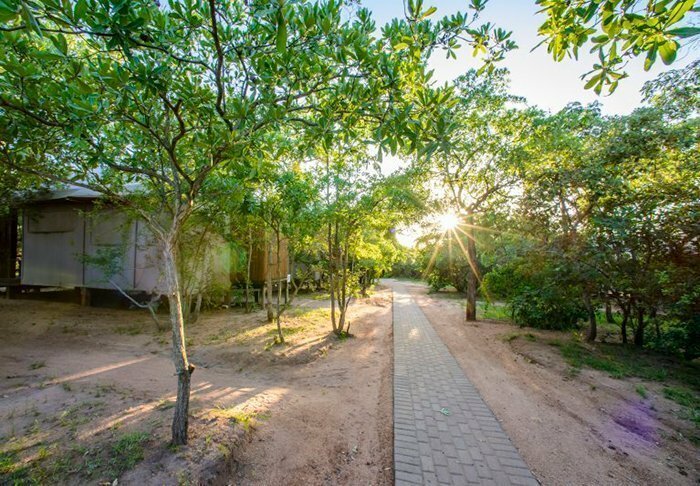 Guided tours of the farm are offered. 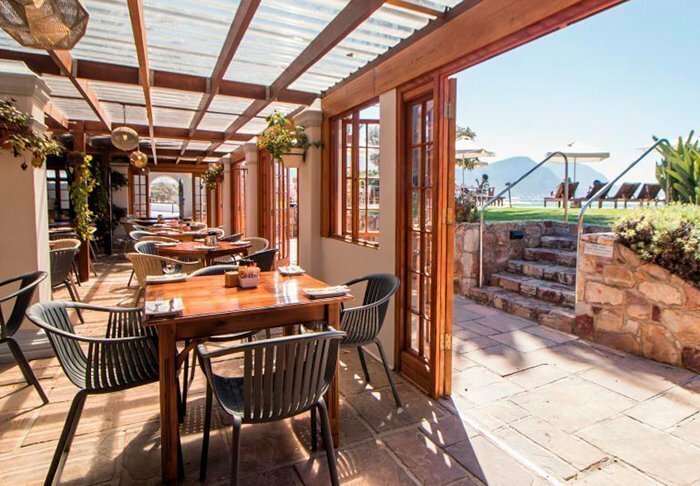 A mere 100 metres from Harbour House Hotel in Hermanus is the town’s official whale-watching point, so we feel justified in concluding that the location is absolutely perfect! 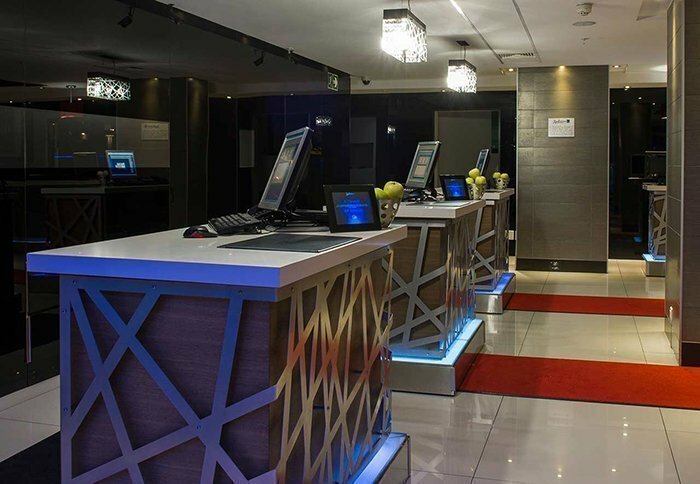 The cosy 4-star hotel comprises 47 rooms, all of which are equipped with air conditioning, tea and coffee making facilities, TV, a safe and a minibar. 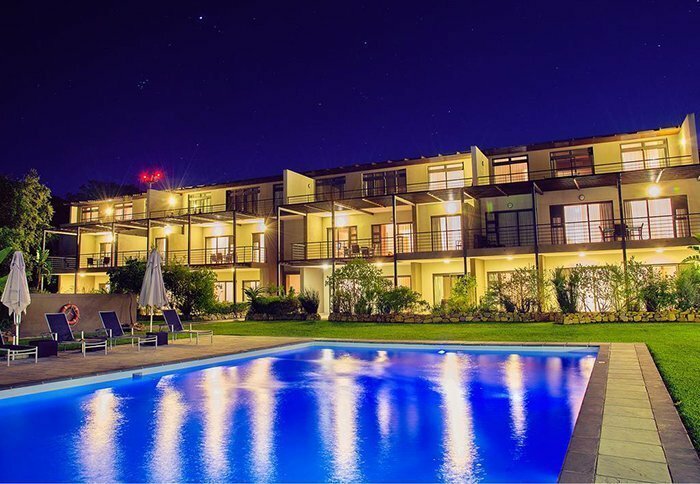 At the hotel, you will find a lovely pool and a nice terrace, both overlooking the sea. 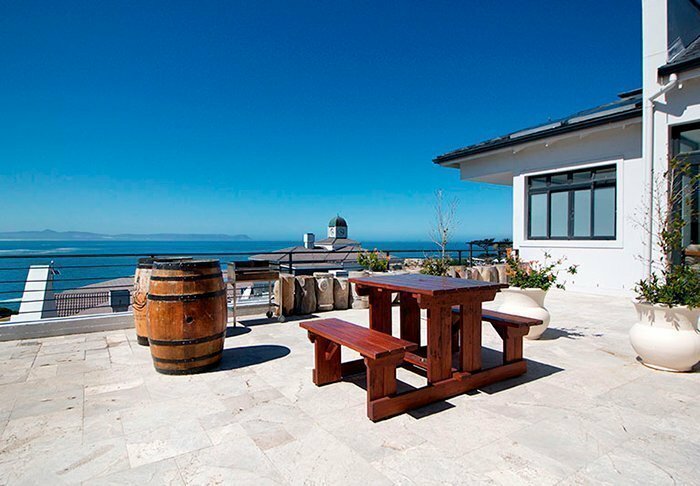 In fact, you don’t even have to go down to the official whale-watching point to see whales in whale season – you can enjoy them from the hotel’s terrace with a good cup of coffee in hand, or a chilled glass of wine at sunset. 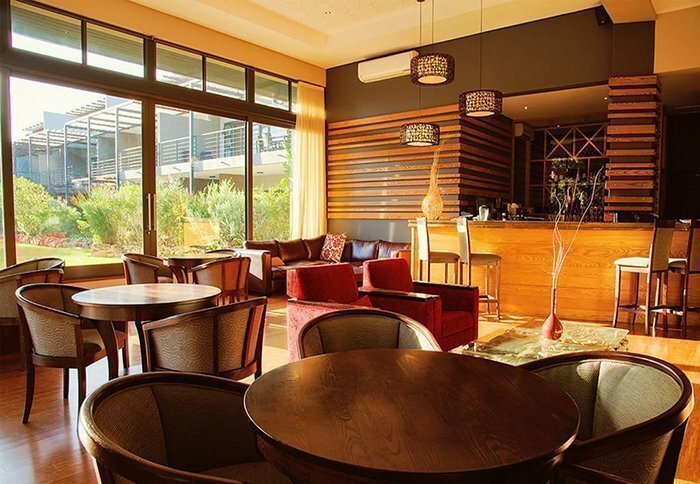 There is a restaurant and a bar at the hotel, but the town’s other restaurants are also just a stone’s throw away. 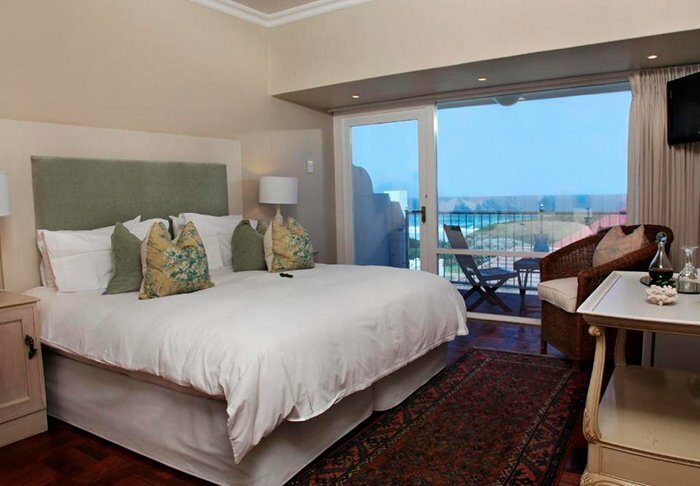 Located a stone’s throw from the beach, this 4-star hotel overlooks the sea and the city. 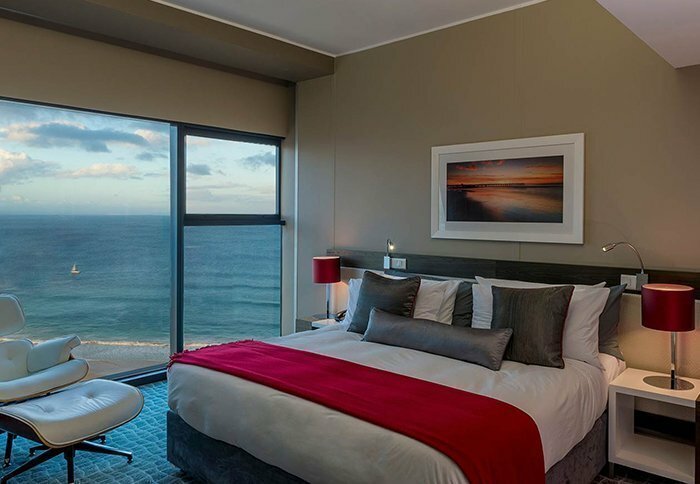 It has just nine rooms, each with its own balcony – also with a sea view, where, during whale season, you can be lucky enough to see the whales romping about in the water. 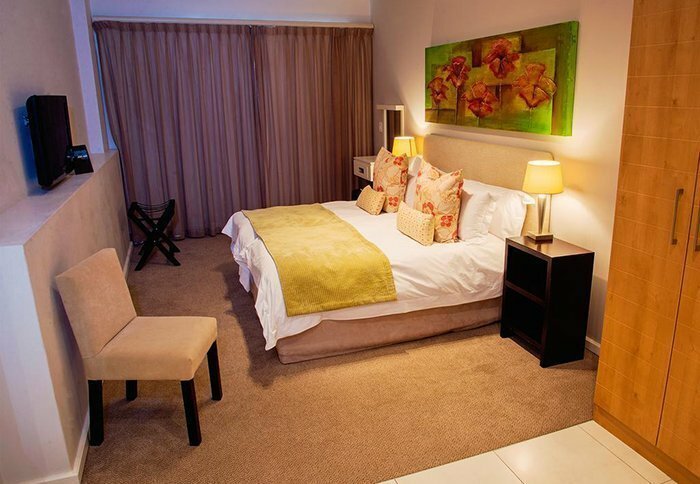 All rooms have an en suite bathroom, minibar, tea/coffee making facilities, TV and free Wi-Fi. 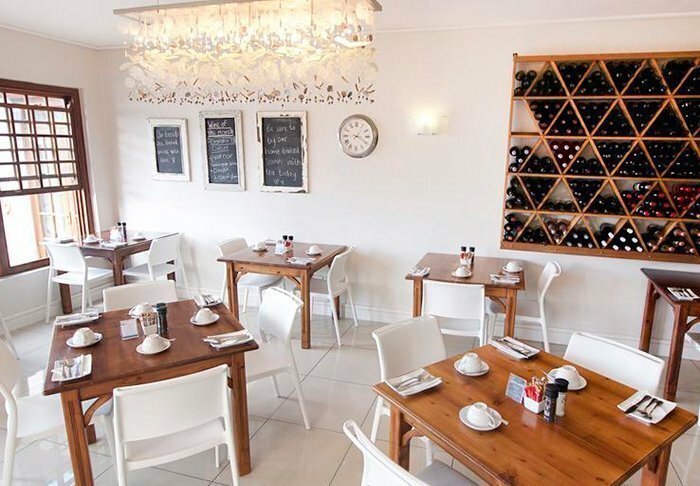 Breakfast can be enjoyed in the cosy lounge, and in the evening, you can prepare your own food on the barbecue in the garden. 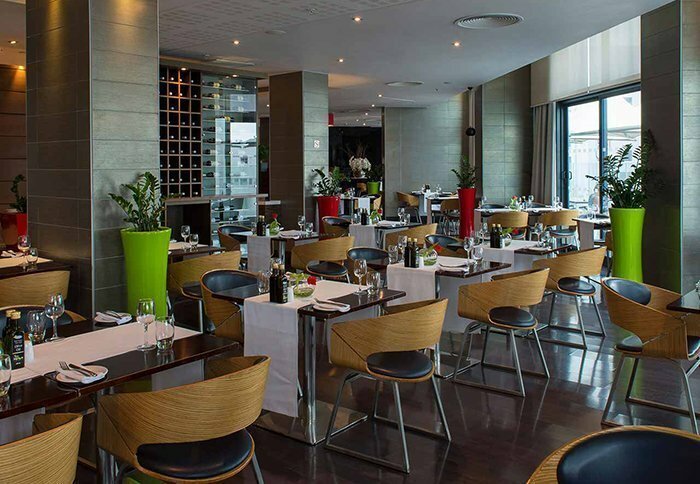 The town’s restaurants are just a 5-minute drive from the hotel. 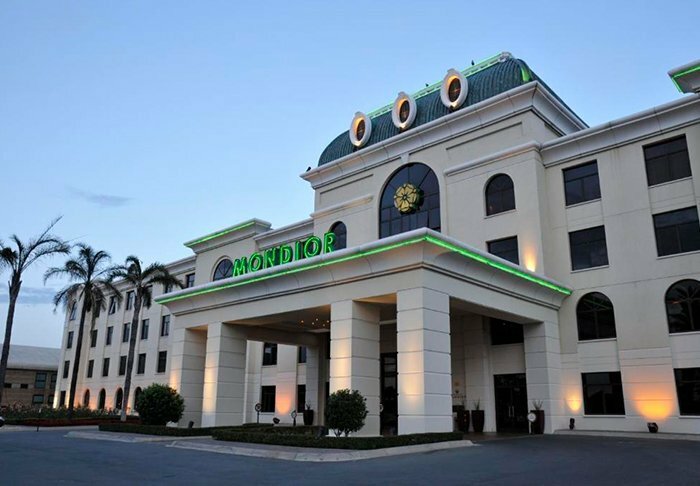 The 3-star hotel Peermont Metcourt is just a 5-minute drive from Johannesburg airport. 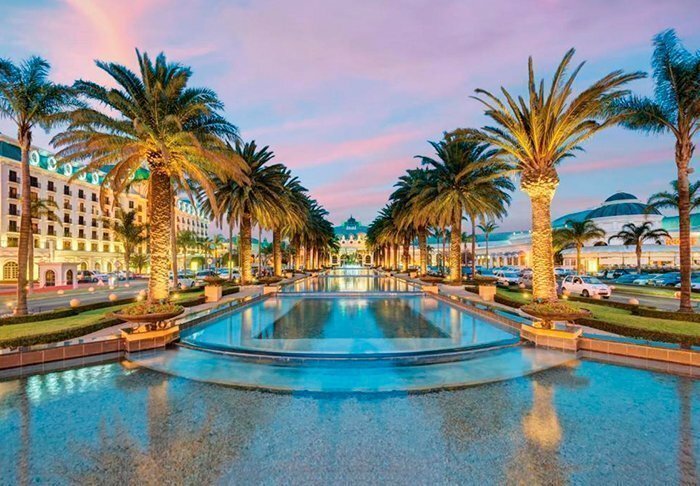 The hotel is connected with one of South Africa’s major casino complexes, Emperor’s Palace. 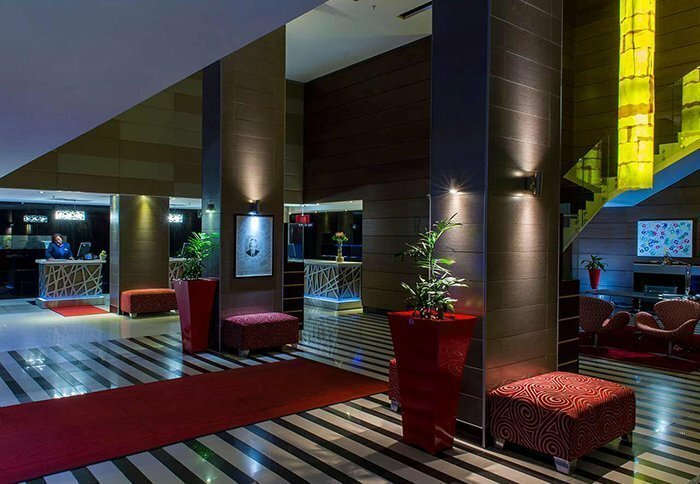 The hotel has 80 modern and well-equipped rooms. 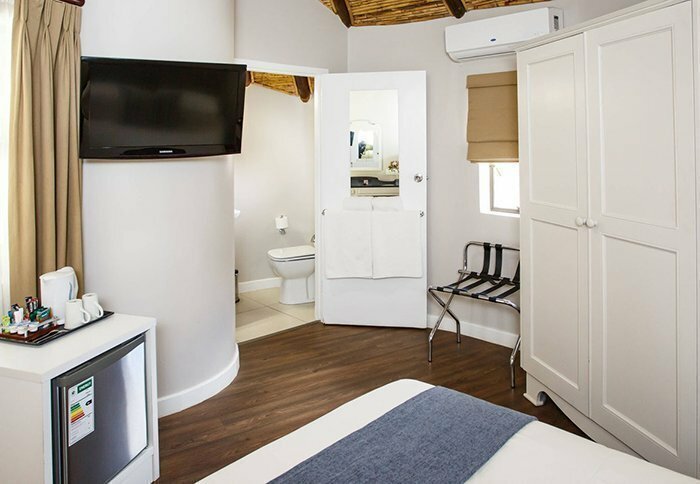 All rooms feature air conditioning, flat-screen TVs, safes, coffee and tea facilities as well as bathrooms with toiletries and hair dryers. 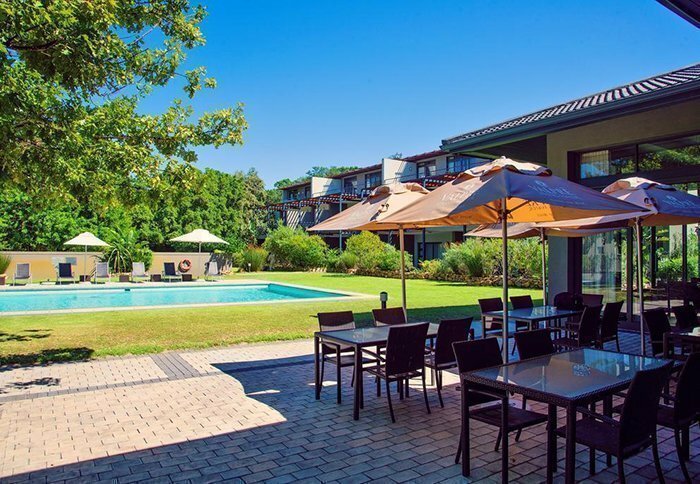 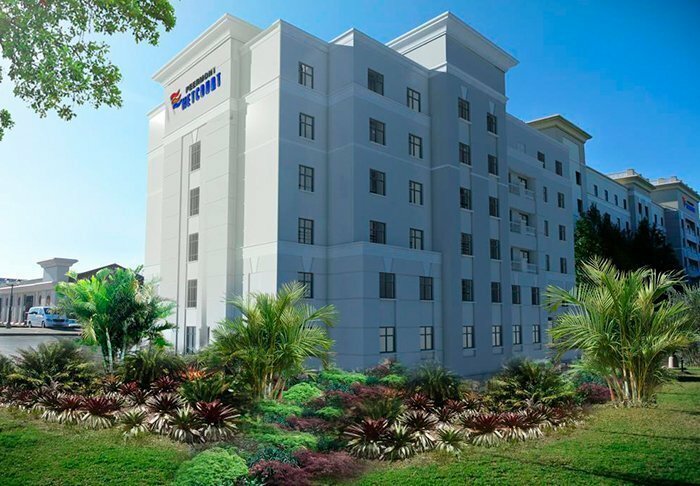 The hotel includes a large garden, swimming pool, fitness centre, spa, and of course, a casino. 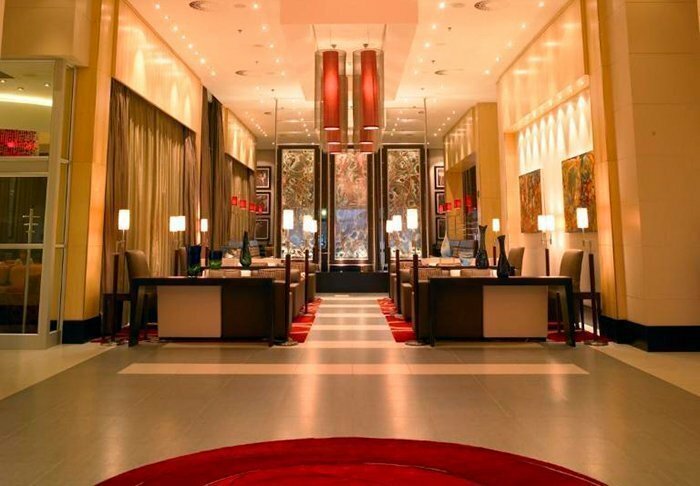 A Turkish bath and massage are available for an additional fee.